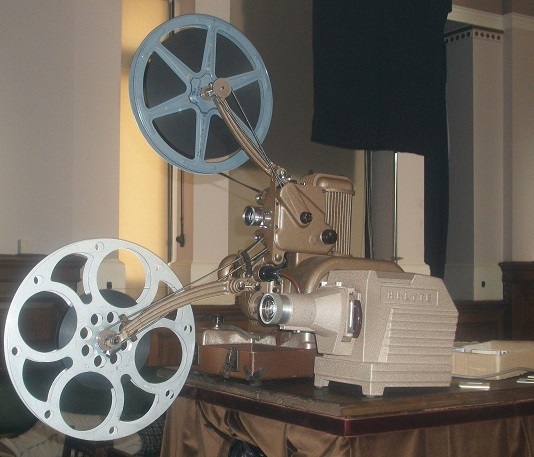 Equipment for period: from 1960's to 2000's. The Ikegami HK 323 was a high quality three-tube colour camera used during the 1980s & 1990s in studios and on outside broadcasts. 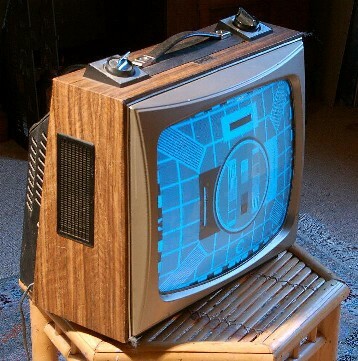 GA-TV has several in full working order. Blue or cream livery. 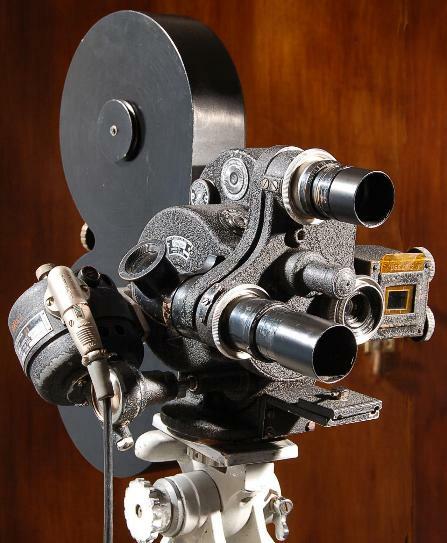 The ARRIFLEX BL is a double or single sound system 16mm movie camera using a mirror reflex viewfinder and a zoom lens. This camera was used throughout the world for tv news, drama and documentaries. 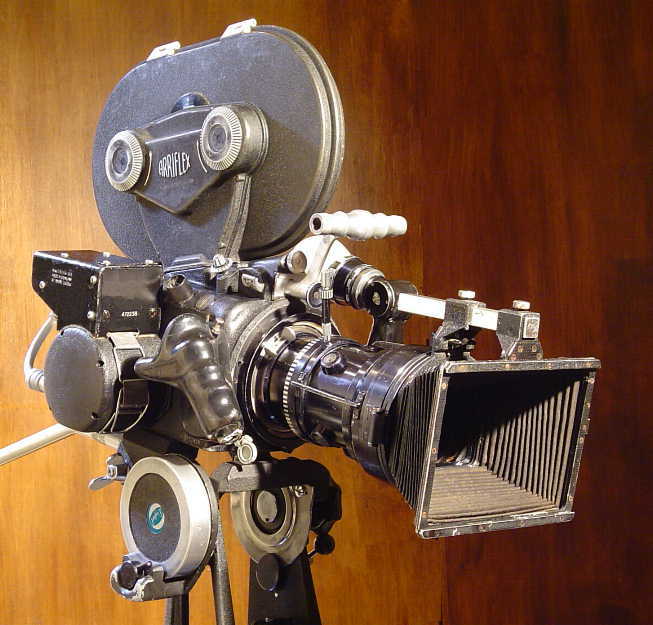 GA-TV has a complete correct-period film rig including 'gun' microphone, headset, sound amp, tripod, body harness and battery. 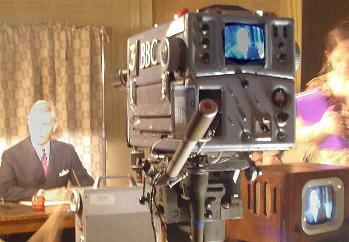 Click to see another image, this shows the camera on location for a recent '1970s' feature film 'news scene'. 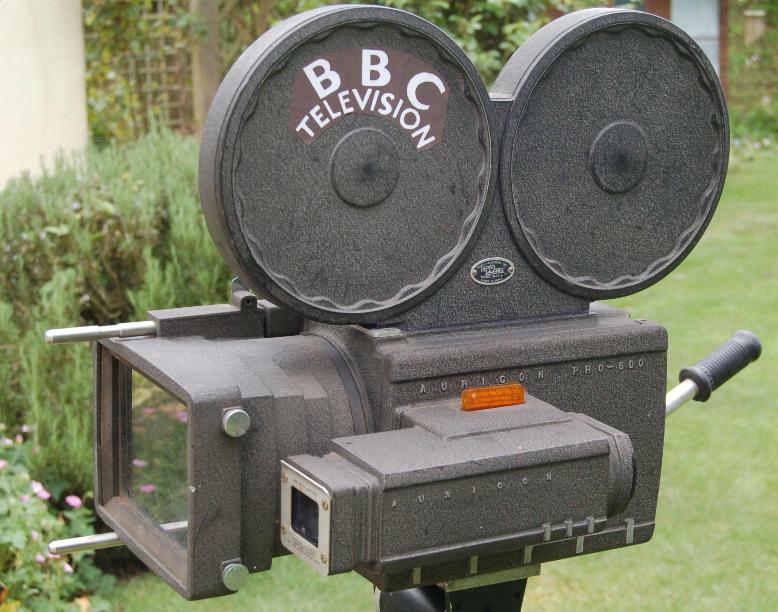 The camera pictured has it's magazine fitted with a 'barney'. 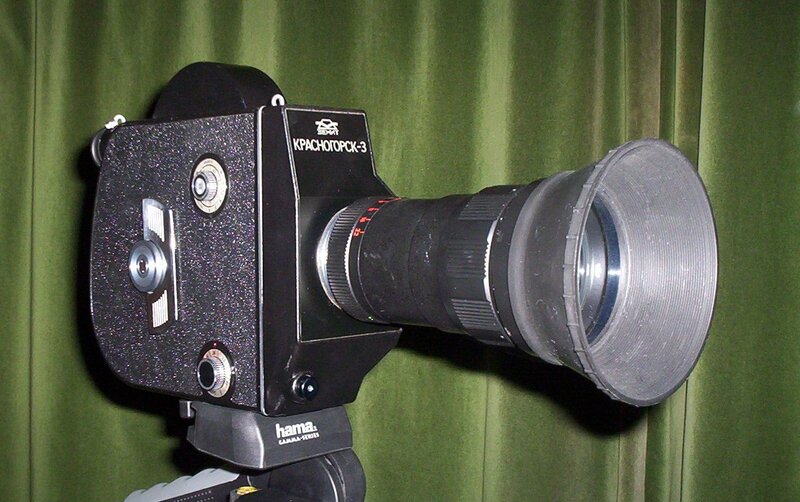 The IKEGAMI HL (Handy Looky) 79A was a ubiquitous portable 3-tube colour camera with zoom lens and detachable battery. Popular with tv news ENG systems. Our example is no longer in working condition. 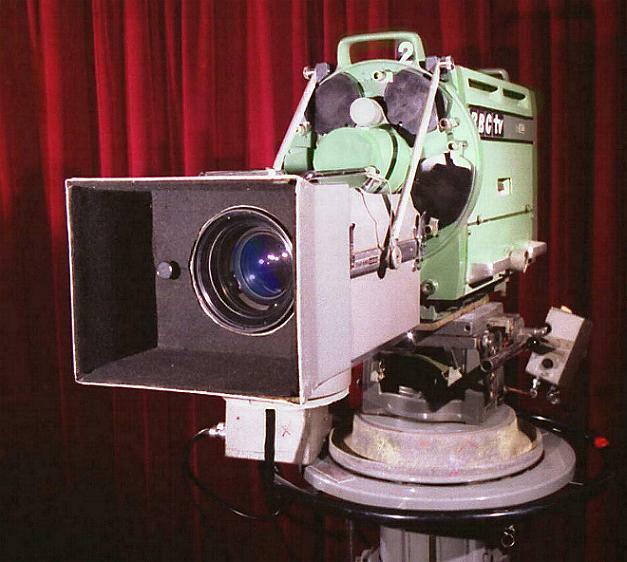 The LINK 125 was a 25mm three-tube colour camera with an integral zoom lens package. 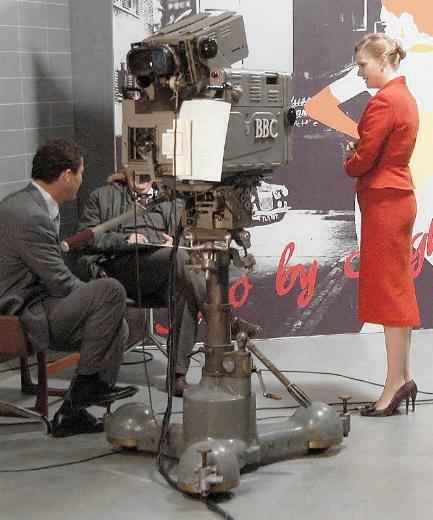 This sleek-looking camera was used mainly in the UK by BBC and in few studios at ITV. 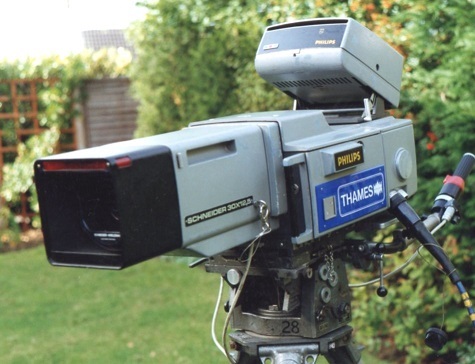 Independent company Limehouse Television bought these cameras because of an in-house cameraman's choice. 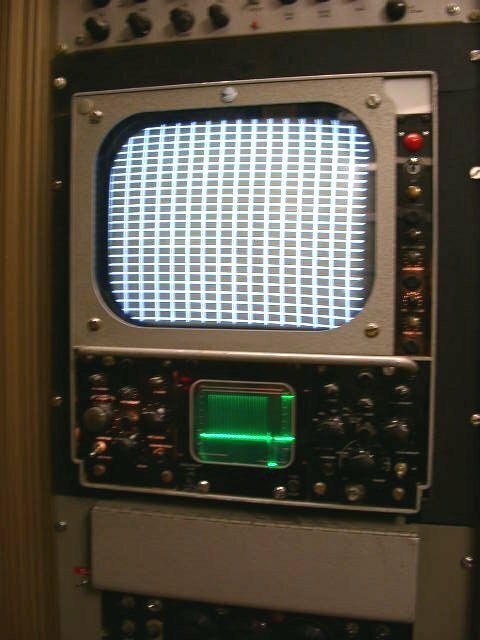 GA-TV has some examples in non-operating condition. 12" monochrome portable receiver. Can be fed a baseband video signal via a modulator. Cream plastic casing. Still displays good pictures. 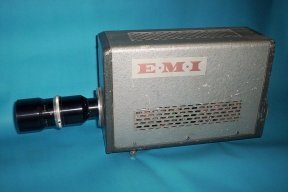 The EMI 2001 was a late-1960s four-tube colour tv camera used by most British tv broadcasters-and in particular-for over twenty years by BBC Television. 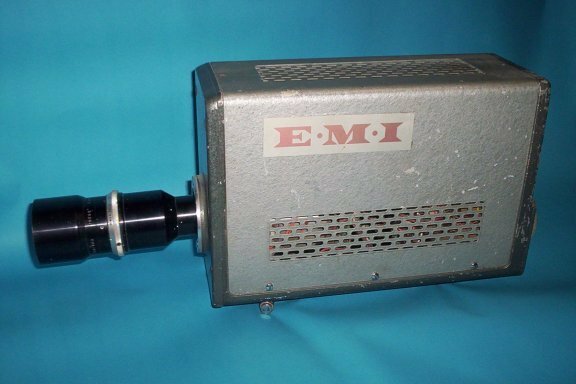 This camera was used in studios and on outside broadcasts. Integral zoom lens. Liked by cameramen. 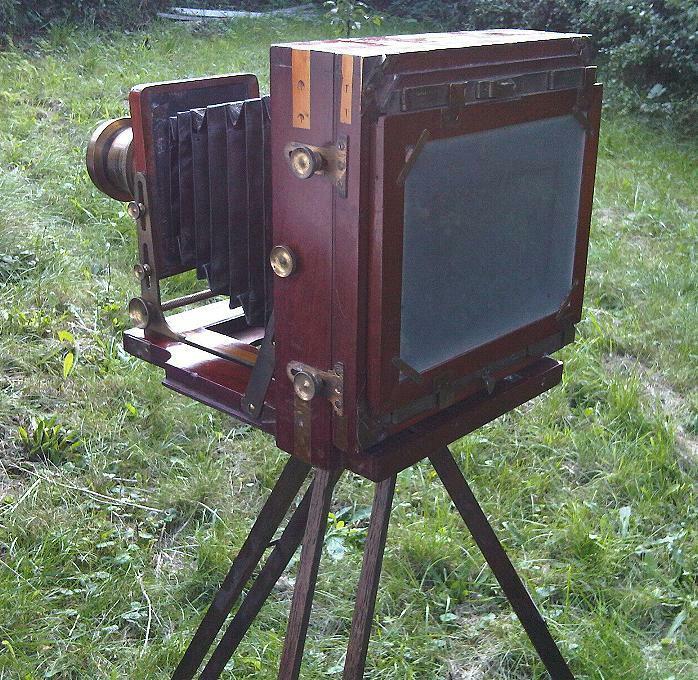 Portable version of the Marconi MkIX three-tube colour camera. 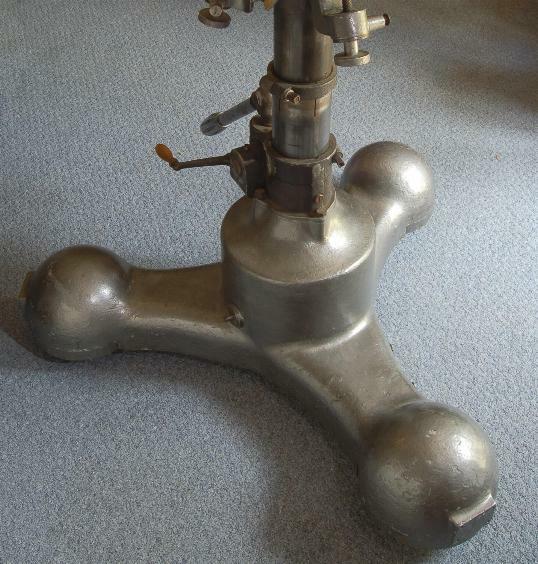 Shoulder-mounted or pedestal use. 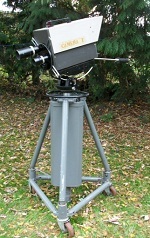 1960s classic turret four-lens image orthicon monochrome television camera. Used extensively by BBC and ITV and notably CBS in America. A world wide best seller in its class. 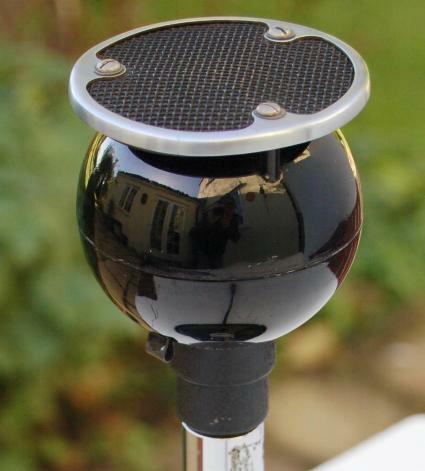 Portable version of Marconi MkVIII studio/OB camera. Requires electronics 'backpacked' (as shown) or 'golf trolley' carried. The one that never was - never produced in quantity. Appeared 1986. 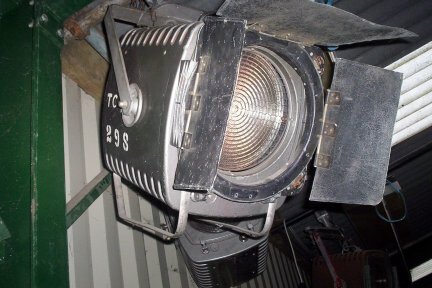 Very large 4 tube plumbicon colour TV camera for studio and OB use. 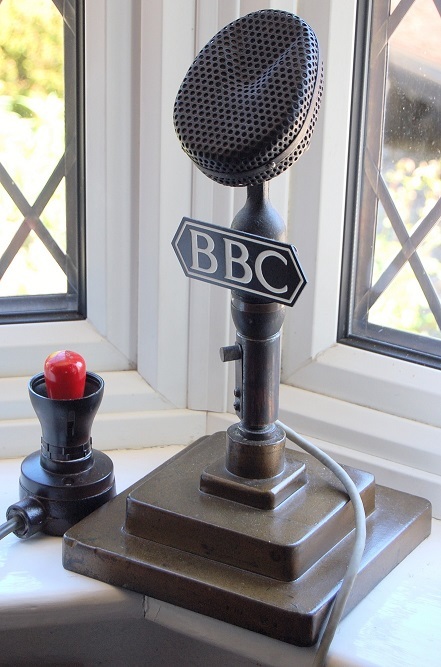 Used by BBC, ITV and numerous countries around the world. 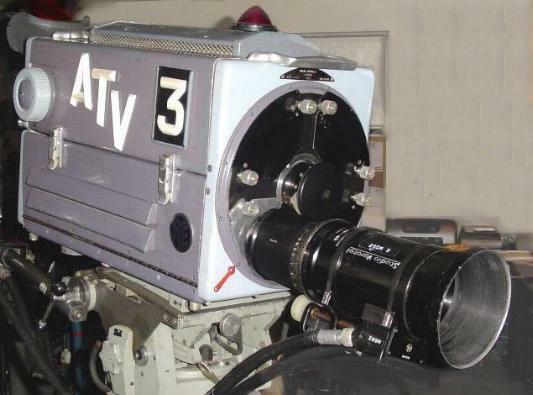 The first self-contained 3-tube portable colour TV camera which made ENG (Electronic News Gathering) viable. Numbered '76' for the US bicentennial year, it was orginally going to be called the TK70. 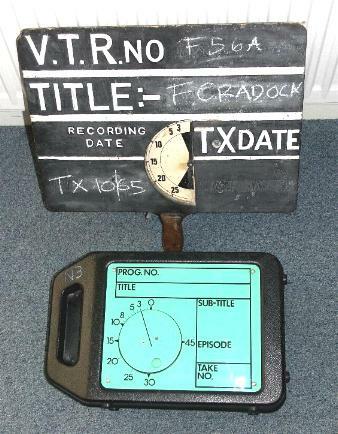 Our example pictured was used by Grampian Tv, who ran a total of five TK76 cameras in Aberdeen and beyond. 14" high quality all valve black and white monitor. 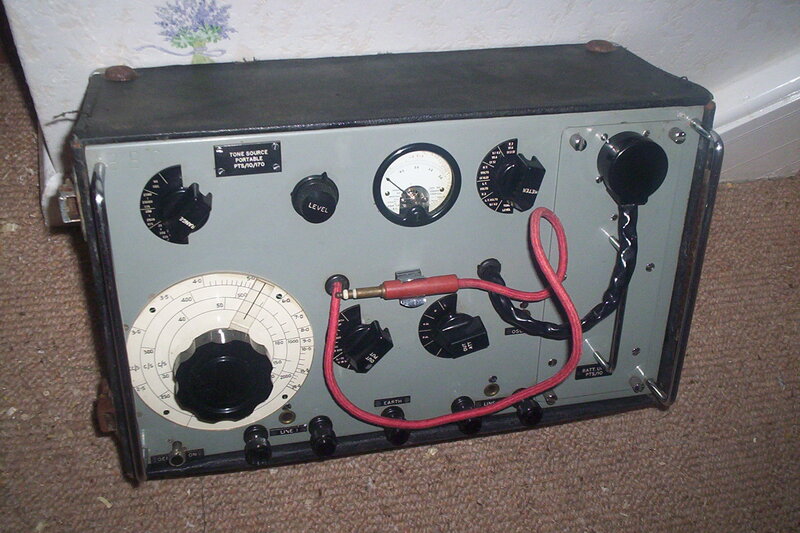 Four fully working avaialable (see also the associated Marconi Mk IV Picture & Waveform monitor). 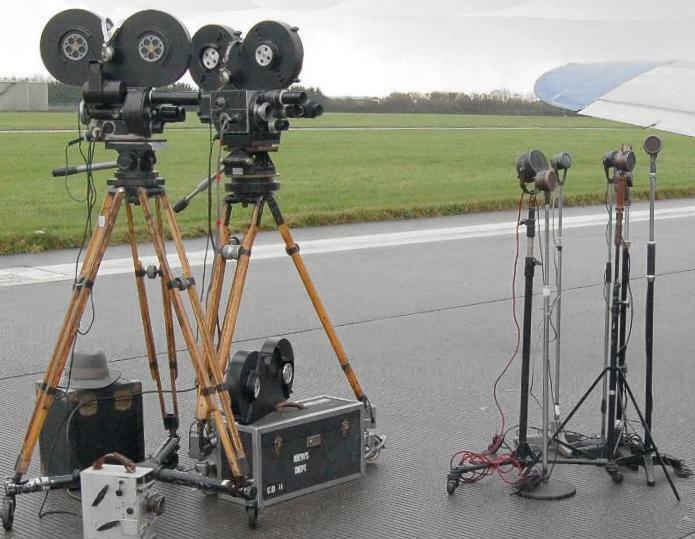 Picture shows all four working on location for 'Showbands' (RTE production). Fully developed 3 tube colour TV camera offering microprocessor control and alignment. Popular around the world and often finding many 'second user' assignments in many places. Mk IV series all valve picture AND waveform monitor all in one case. Five fully functioning units available. Excellent pictures. 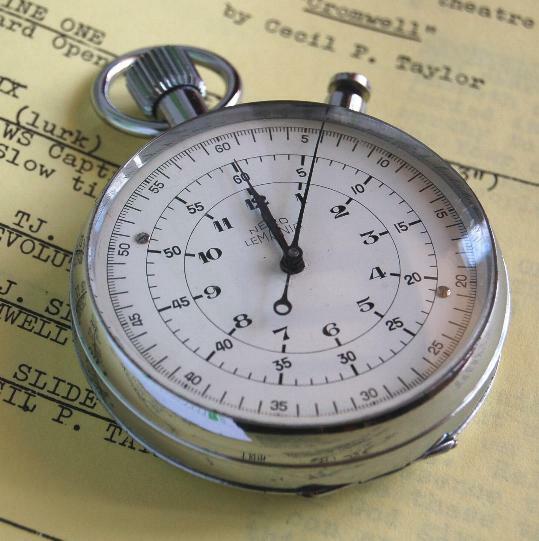 Found in production galleries, OB trucks and engineering areas. Following in the tradition of the Mk III and Mk IV picture AND waveform monitors in one case, the Mk V is an all transistor design capable of very good results. Currently 6 out of the stock of 11 are in good working order. Large, console model, with doors, dating from 1960. This set (originally supplied by Harrods) is a real luxury model from the time. Can have a modern 'implant' monitor imperceptibly fitted to give a convincing picture. A very popular camera worldwide offering good performance and triaxial cable (LDK5 only, LDK25 is multicore cable) capability. This made it a natural choice for ob operations - especially at the BBC in the late 1970's. 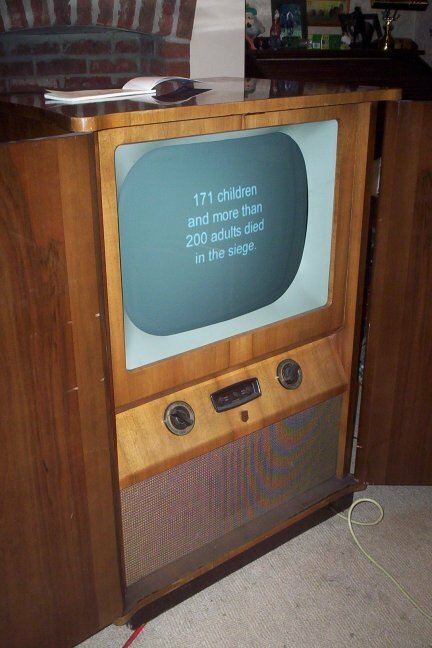 Very common British colour TV from the 1970's. This one just shouts '70's' and is now fully operational giving an excellent and reliable picture. 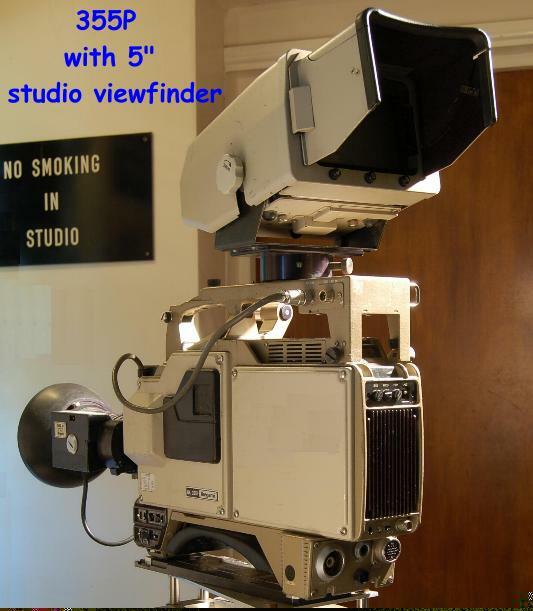 Full size 3 tube studio colour TV camera. Electronically very similar to the RCA TK47, but the styling is very different. 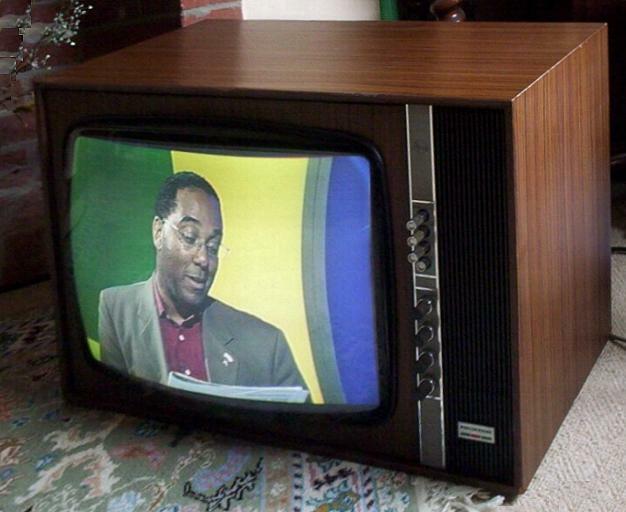 Early 70's ultra reliable 19" colour TV. Wooden case, very keen price at the time and very common. 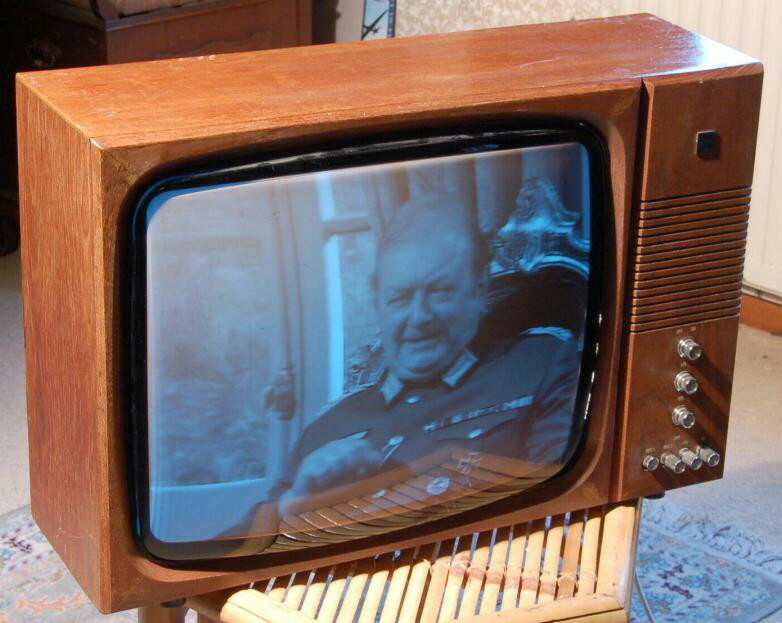 British made colour TV from the early 70's available in many screen and case sizes/styles. Most are operational. Some are upmarket versions, others are base models. 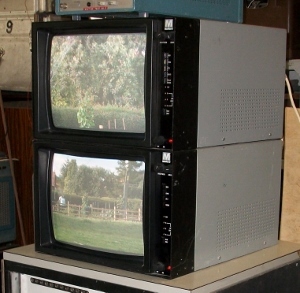 A series of 'delta gun' shadowmask 20"-inch colour monitors used for broadcast applications. Nine working units available plus a working 14"-inch version and a working series III unit. Very good colour pictures. 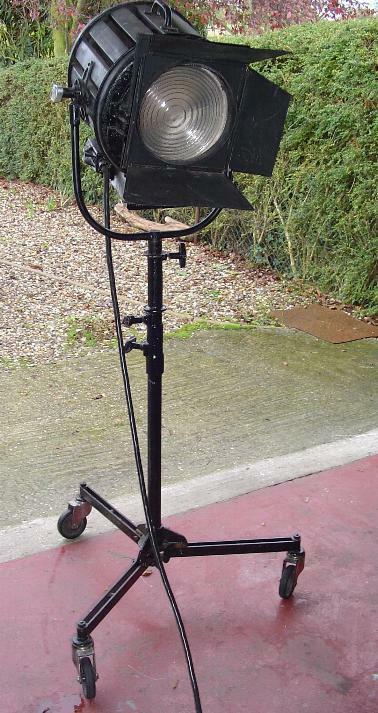 Wheeled monitor stand (pictured) available if required. 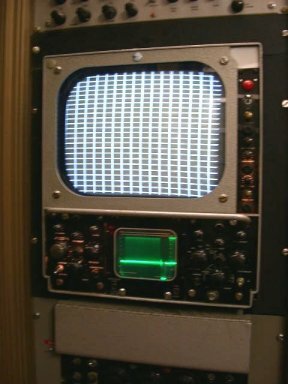 All valve,tinted faceplate monochrome small screen 60/70's. One only, fully operational. 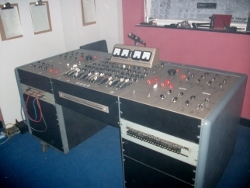 Built by the Marconi Company in 1967 as one of a pair to start off Yorkshire Television in colour, this unit now belongs to Golden Age Television and has been fitted out with a view to facilitate re-creations from the early 1960's to the early 1980's by changing out some key items (mainly monitors). 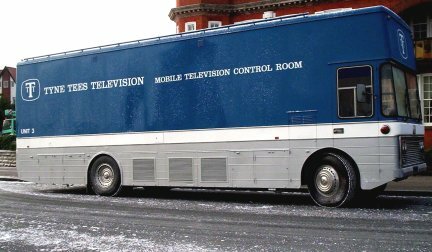 Now operational and available with a selection of monitors and cameras the unit has already been used in 'The Royal' for ITV and is currently in blue/white/silver and 'Tyne Tees' logos (removable). The vehicle is fully road legal, is 32 feet long and weighs 12 tons. Packed full of vintage equipment in four areas, production, sound, engineering control and engineering racks. The production areas lend themselves very well to gallery reconstructions with views through. Please enquire for further details. 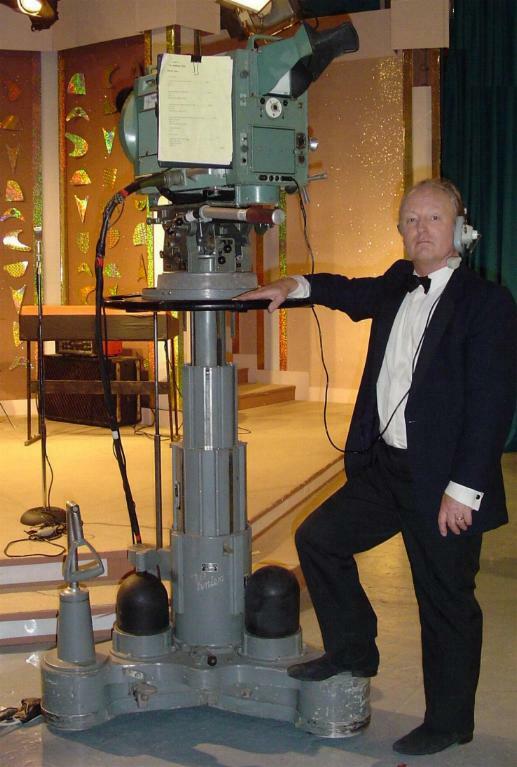 Believed to be the first colour outside broadcast unit in service with ITV. 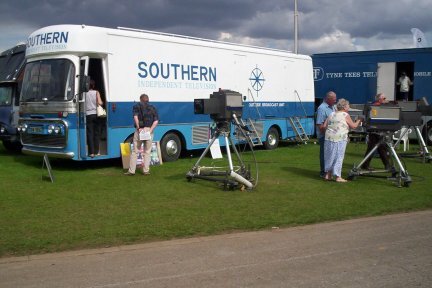 Built by Southern Television Ltd. in 1968, coachwork by Del of Southampton, electronics mainly by Marconi, this vehicle retired in 1995 after several refits. Now restored to 1968 operational status with four working Marconi Mk VII colour cameras, this is a window into early colour TV operation in the UK. The vehicle (a Bedford VAL) is 34 ft long, weighs 11 tons and is fully road legal. Unusual 'longitudinal' layout with sound, production and engineering laid longways in the manner of a corridor train. Wood panel interior. Comes complete with 30 ft pneumatic mast. 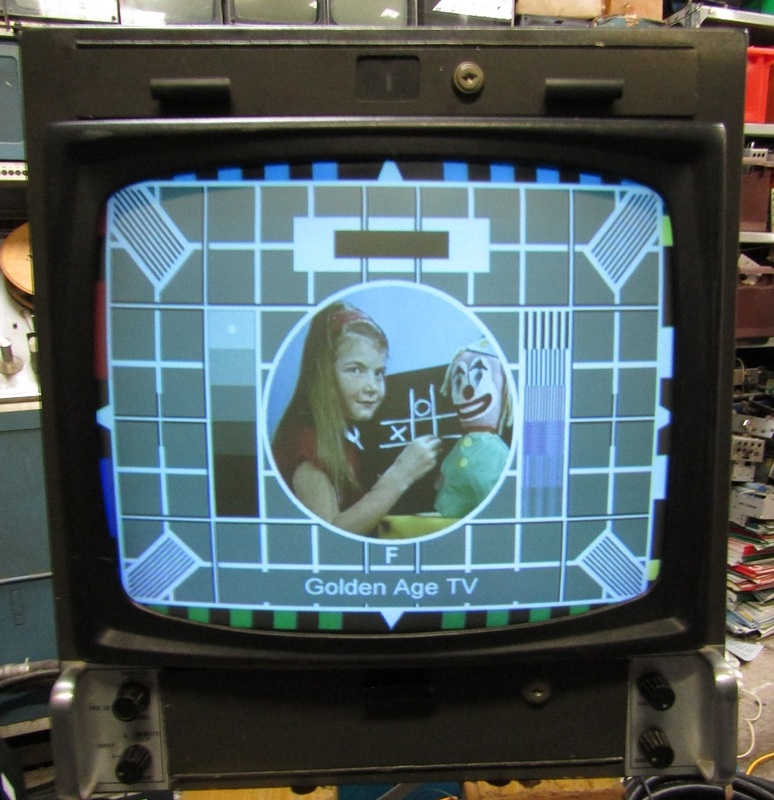 Now in original 'Southen Television colours and logos. Logos require separate negotiation. Please enquire for further details. 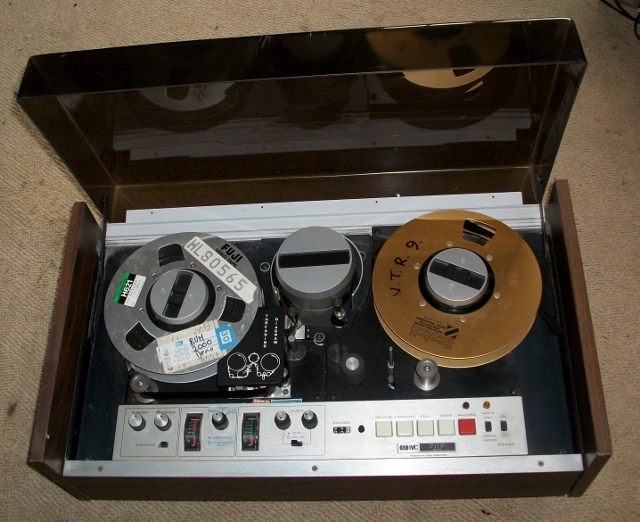 Portable 1/4 inch reel to reel tape recorder, typically as used by news reporters but also some sound recordists. Fully operational. 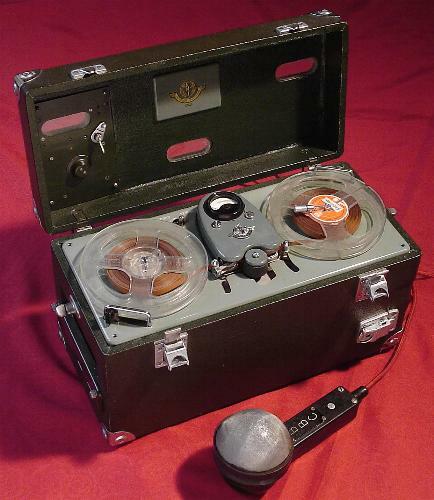 Heavy duty 'transportable' 1/4 inch reel to reel audio recorder. Operational condition. 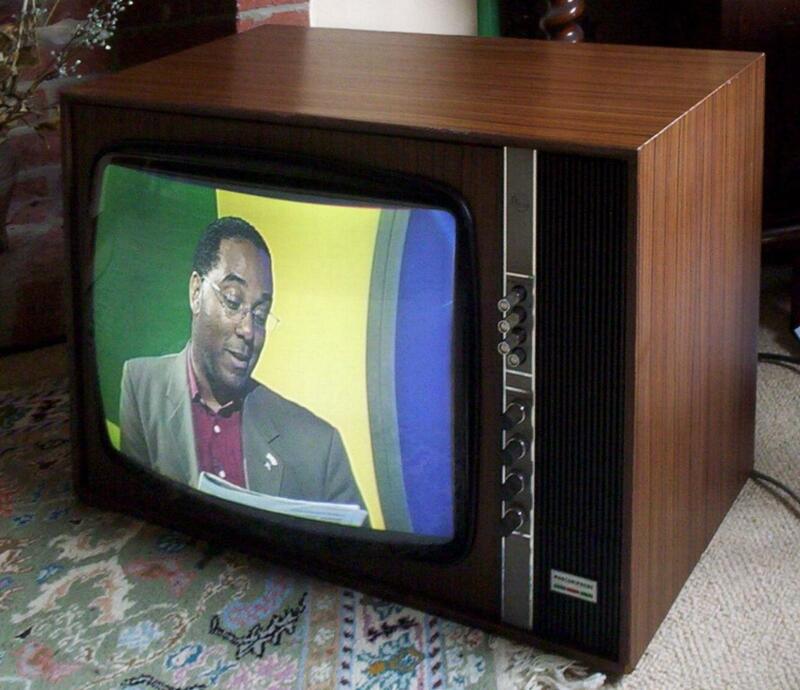 First in the series of similar looking 'Thorn' portable TVs. This one is fully operational on 625 lines and is a very early one being largely valve with only a few transistors (hybrid). Later models in the 70's progressed to all transistor and on to integrated circuits. Externally the appearance remained similar. This one dates from the late 60's. 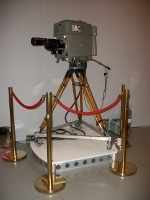 A high quality 4.5 inch image orthicon monochrome tv camera with an offset 4-lens motorised turret. 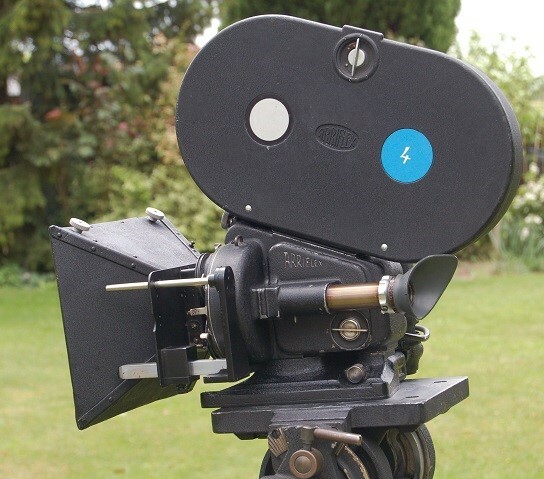 Produced in 1962 and first used by ATV at their Elstree studios, this camera was used also by Anglia Tv in Norwich and BBC tv at the Television Theatre and Riverside studios in London. A total of only about 60 cameras were sold. 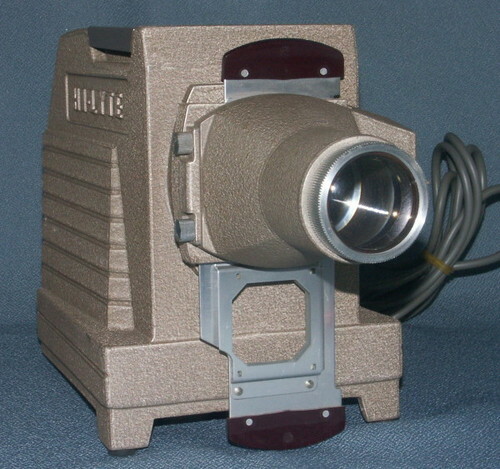 2" Quadruplex VTR, very large, very heavy. One unit in full working order. Excellent multi standard machine. Transfer work considered - please enquire. 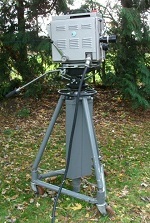 General purpose 'Drainpipe'caption/CCTV/Industrial/Military 1" vidicon TV camera. Currently, one fully operational unit. See also roller caption machine. All valve industrial CCTV or caption camera. See also roller caption machine. CCTV camera for security, industrial, scientific and medical applications. 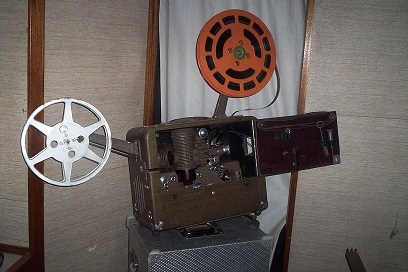 Sometimes used as a caption camera in budget installations. All valve monochrome monitor. Three fully working ones available. Appears under the brand name of 'Peto Scott', actually a Philips company. The one in the picture still wears original markings! 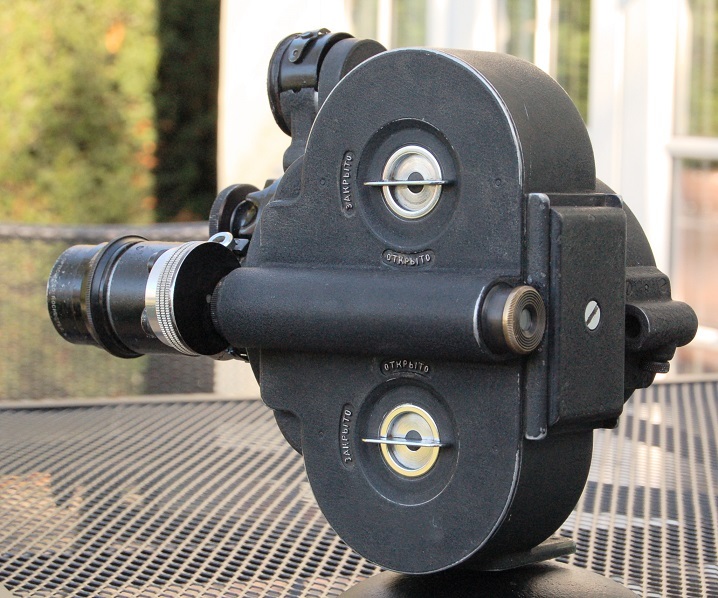 Light weight fluid drag pan head, 75mm bowl fitting usually on a Miller Tripod. 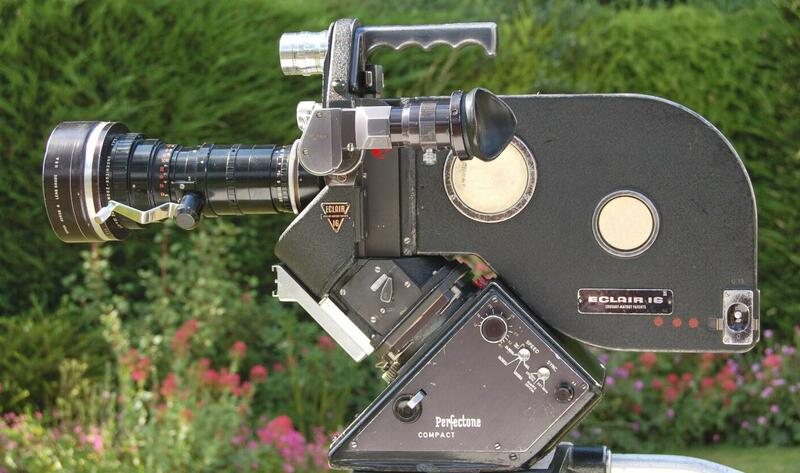 Useful for 16mm or ENG cameras. 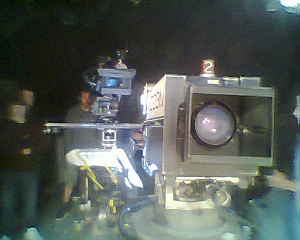 Studio/OB CCD television camera. 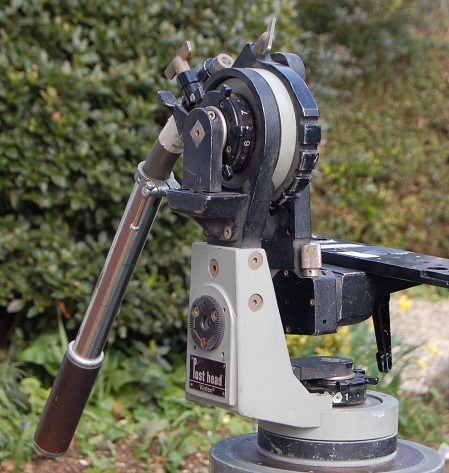 An excellent workhorse and still in use worldwide. 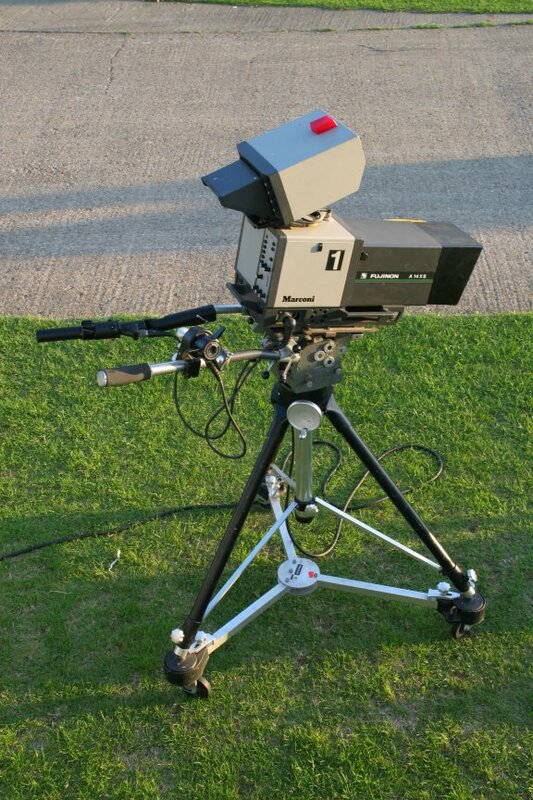 We have two examples of these cameras in full working order complete with triax base stations as required. 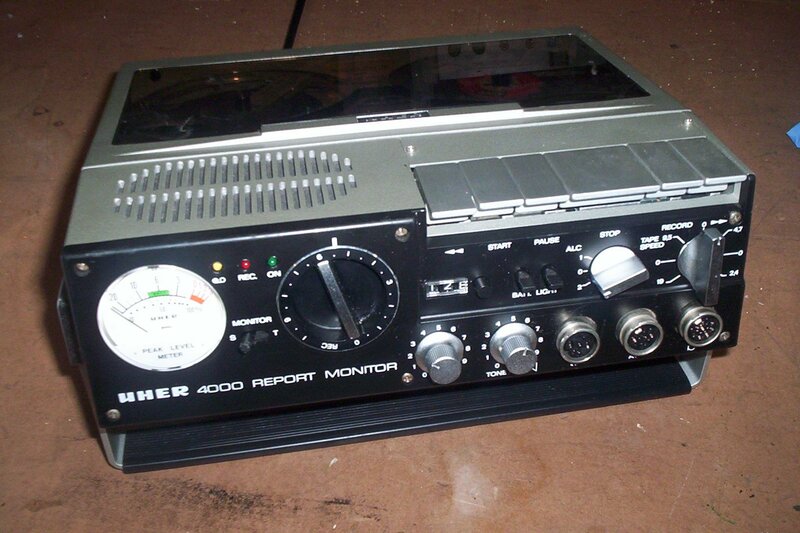 The UHER 4000 REPORT S was a 1/4" magnetic tape recorder used by national and local radio stations. 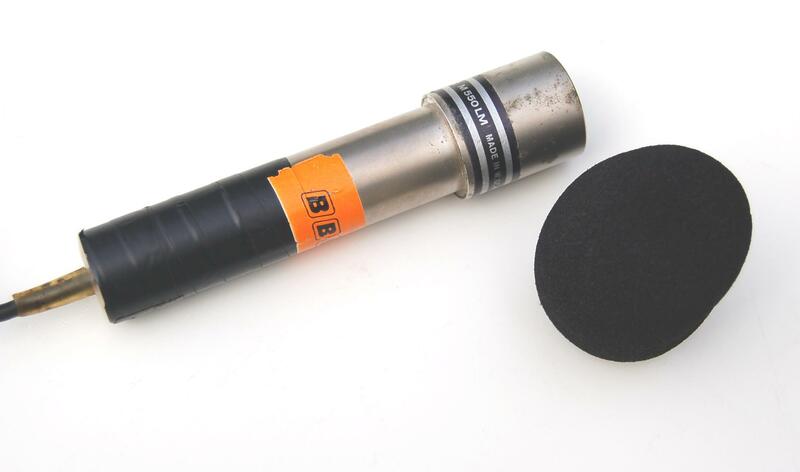 Also in the picture, a BEYER dynamic M550 LM microphone ex-BBC. 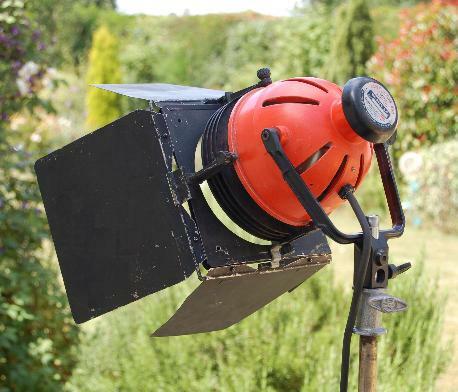 2kW fresnel Spot for pole operation of pan, tilt and focus. 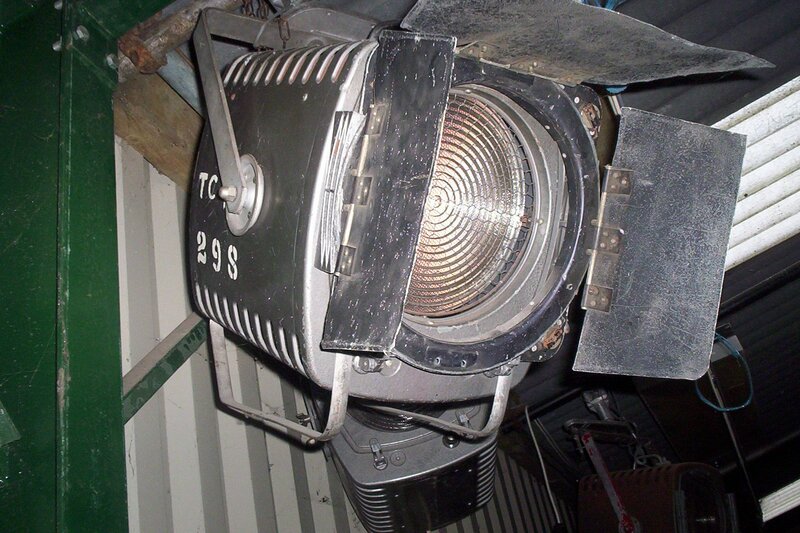 A mainstay of television production lighting at BBC Television Centre in the 1960s and 1970s. All eight of our examples are fully practical with new wiring and lamps. 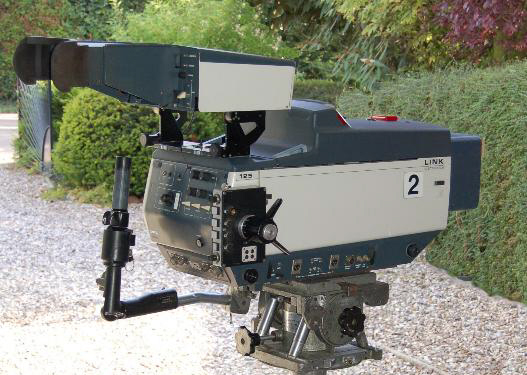 The Link 130 was a mid- 1980s camera that never made it beyond a dozen or so 'trial' deliveries to broadcasters (some to BBCTV and Swedish TV amongst others). 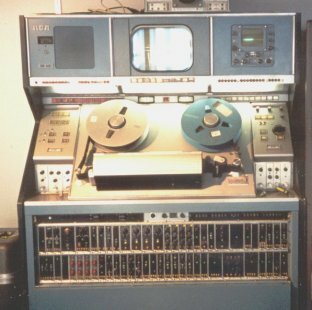 The Link 130 had many 'auto' features and used three 2/3rds lead oxide colour tubes, but the camera was plagued with software problems including 'lock outs' and niggling faults such as the cue light effecting the picture. 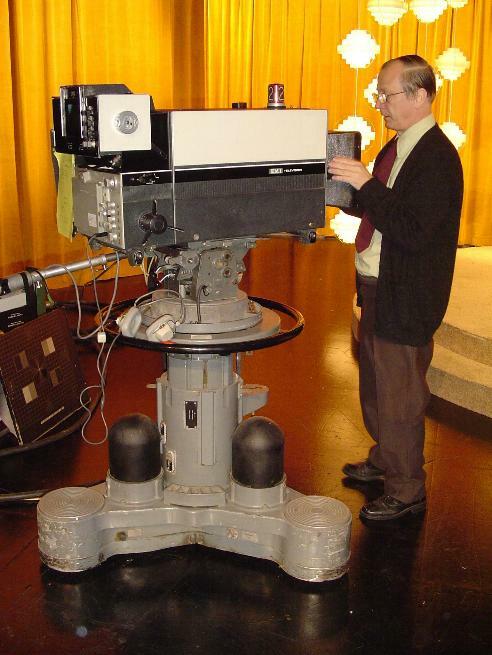 Also, by the end of the 1980s, all the major broadcasters were considering switching to CCD studio cameras. 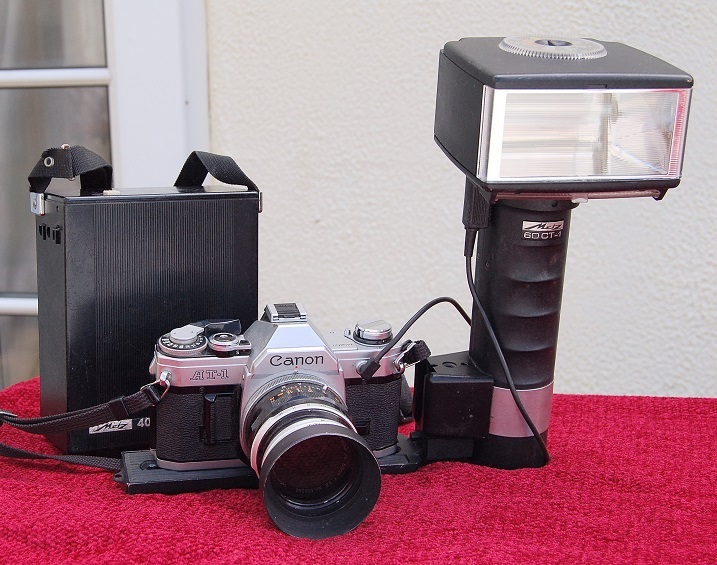 The camera pictured is an ex-museum display with a non-standard repro lens unit (with space to house a small ccd camera)and a fixed viewfinder unit with an implant tube. 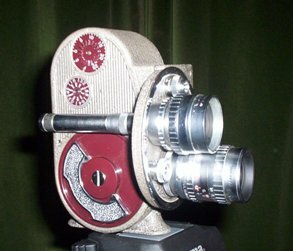 Because the camera is only a shell and thus lightweight, it is ideal for theatre productions etc. 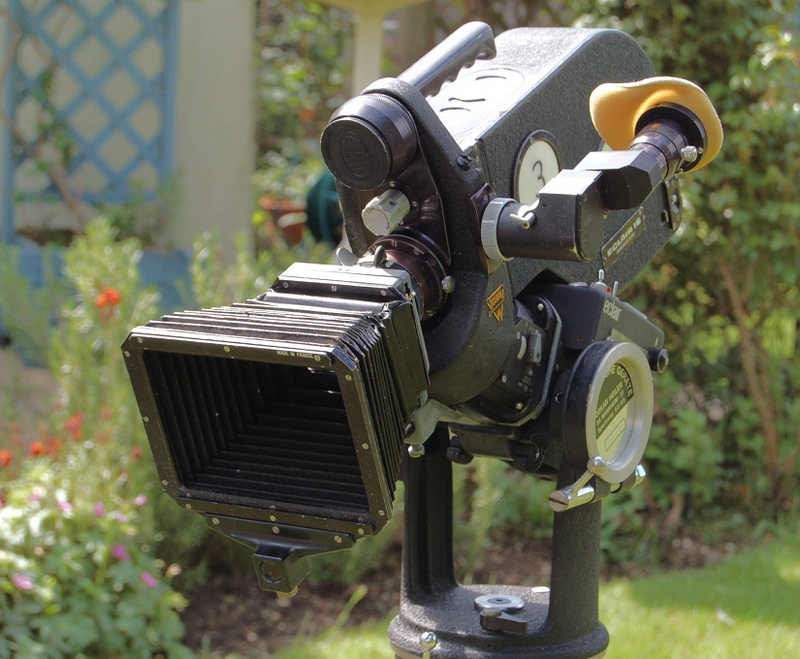 The camera here is sitting on a Vinten 459 lightweight pedestal with an additional 'steer' wheel. 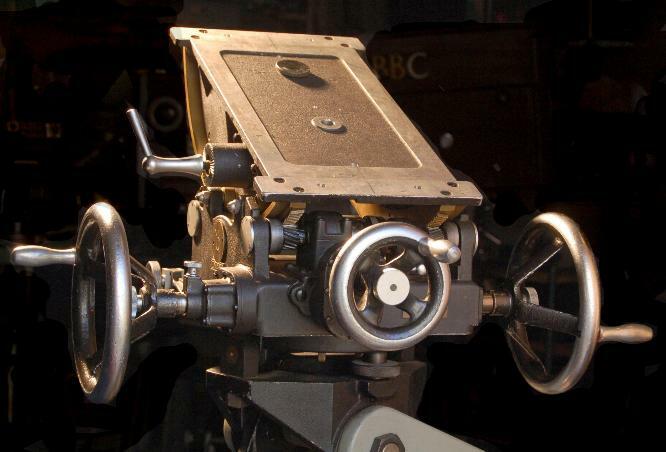 Motorised caption roller (one on stand). Fully operational, backwards/forwards, variable speed and remote control. Credits list from the days before computerised graphics. 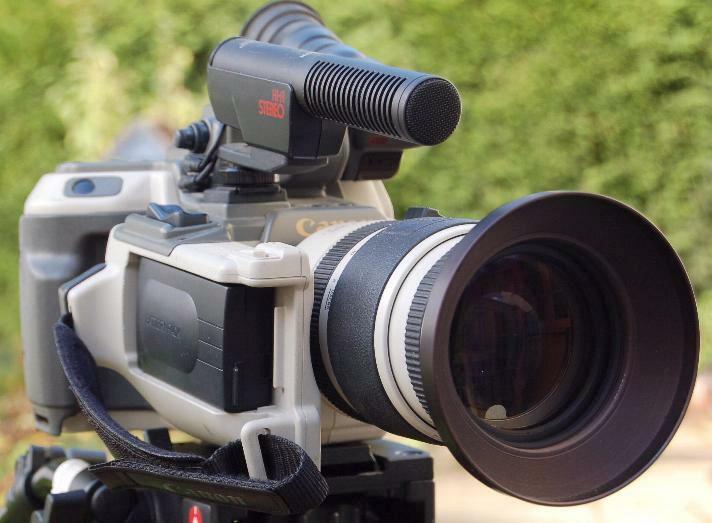 Superior broadcast colour tv camera, the Ikegami 355 portable is an early 1990s 3-CCD model capable over 650 lines of horizontal definition. GA-TV has three examples (4:3 aspect ratio only), all in working order. 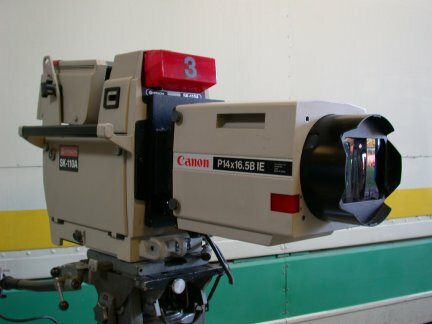 This camera is still used worldwide. Scotch was one of several video tape manufacturers. The item pictured is a 1-hour 2-inch 'quadruplex' video tape, the standard first introduced in 1956 by Ampex. GA-TV has many of these video tapes including the carry cases and also the means to reproduce the tapes. Tape-to-digital copying is part of our service. The Vinten PLOVER 3179 ob/studio pedestal is a compact and relatively lightweight nitrogen-balanced item using a Fulmer type central three-stage column and three sets of linked wheels which can be either pneumatic or solid. The centre column can be easily separated from the wheeled base for transportation. 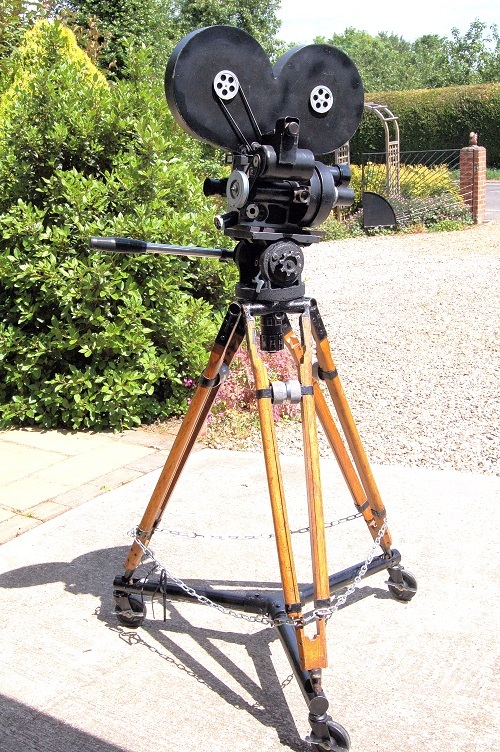 The Plover pedestal can take a camera/pan head combination of up to 105 kgs.The front sets of wheels fold for storage. 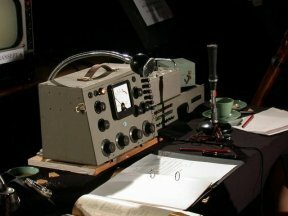 Commemoration of the opening of the BBC Television Service in November 1936, GATV 'Unit 3' went to Alexandra Palce in London to make a programme using three operational Image Orthicon Cameras (two Marconi MkIVs and one Marconi MkV). B & W DM/A. B.B.C. 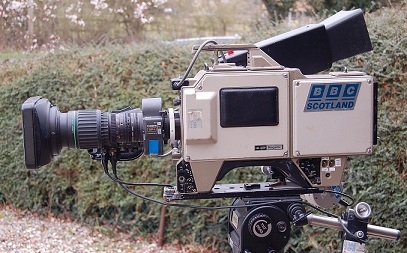 The LINK 110 was a boxy-looking three-tube 25mm lead oxide colour camera, a technical design instigated in part by the BBC to replace their aging studio stock of 4-tube EMI 2001 cameras. 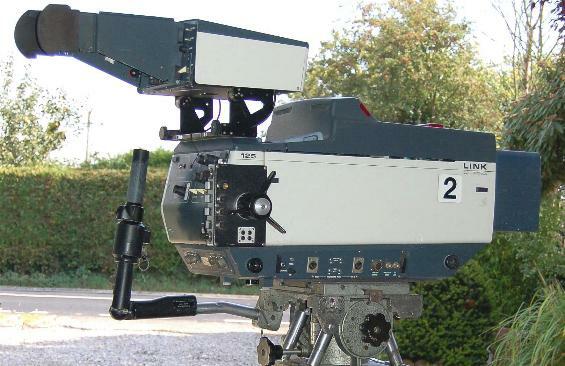 The Link 110 (from Link Electronics; a firm that produced 'industrial' CCTV equipment) boasted anti-comet tail and light bias, plus an integral zoom package. 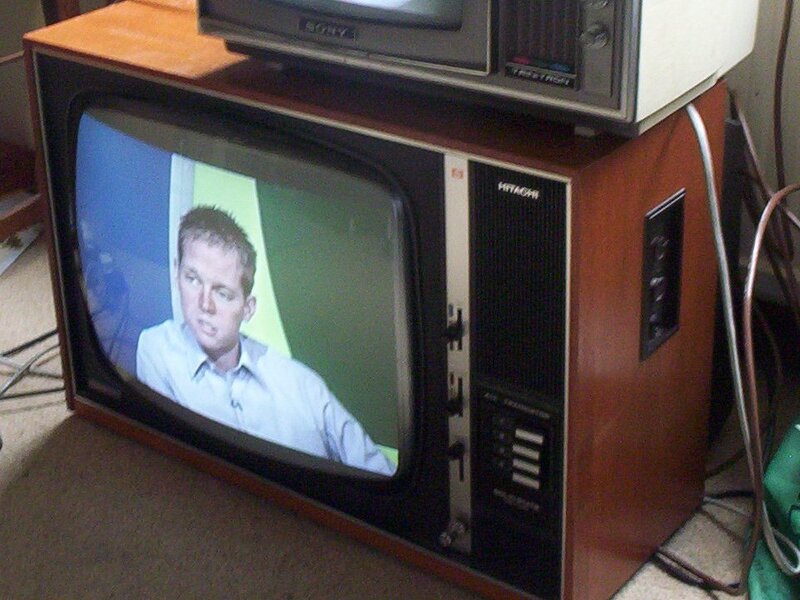 The camera's picture quality was reasonably pleasant but not up the 'sharpness' of existing 4-tube designs. This portable 1980s vt machine is complete with travel case and repro badging. A battery-powered 'U-Matic' videocassette recorder from Sony to compliment our range of portable ENG colour cameras of the period. 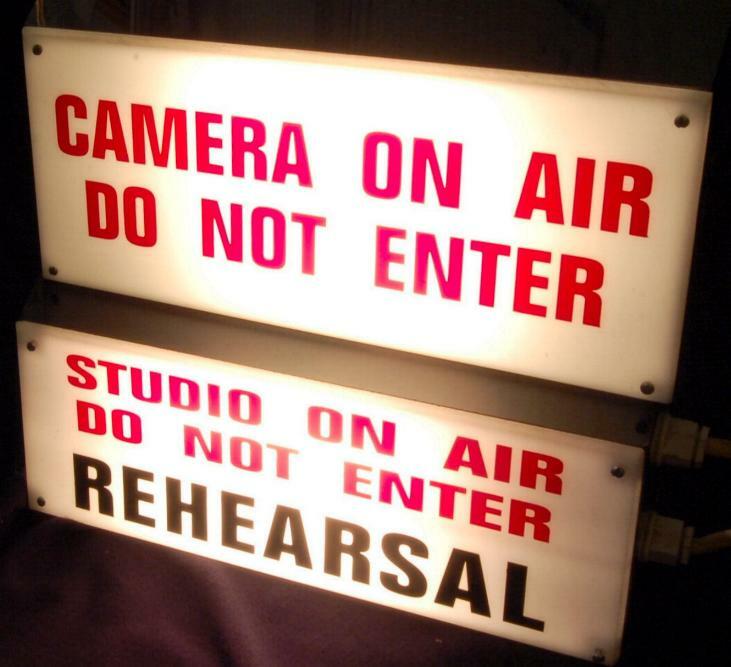 A genuine antique, late 1960s 'ON AIR' tv studio sign from ITN's 'Studio One' at their erstwhile HQ in Wells Street, London. 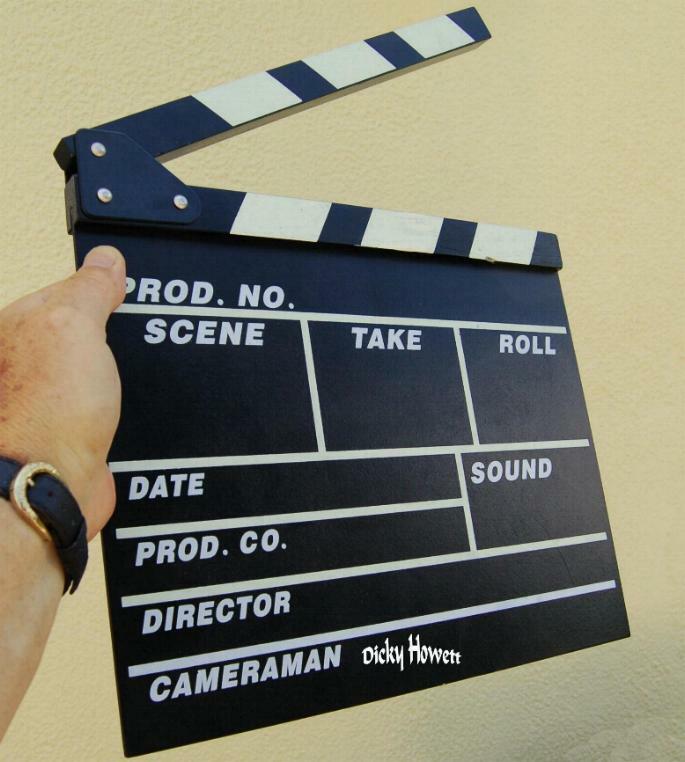 A hand-made item, now restored, the sign was fixed originally by the entrance to the studio (as a dire warning). Original white lettering on a red base replaced by white on black. A GENT tv gallery clock with assorted legends underneath,'TX' 'VISION' 'SOUND' etc. 1980s ex-BBC Leeds. ARRI NEWS RIG. 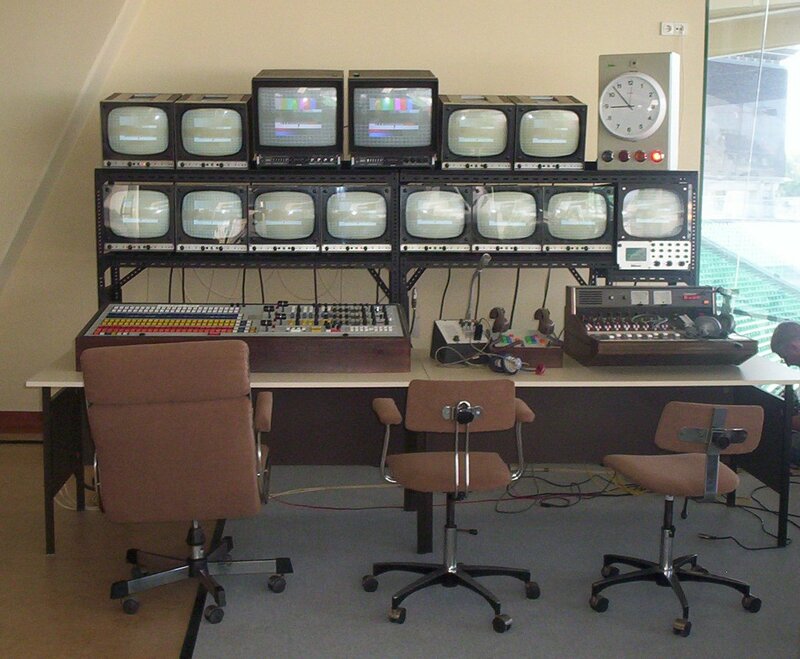 Click for larger picture which shows a complete 1970s newsgathering outfit, mics, amps, cameras, exposure meter etc. 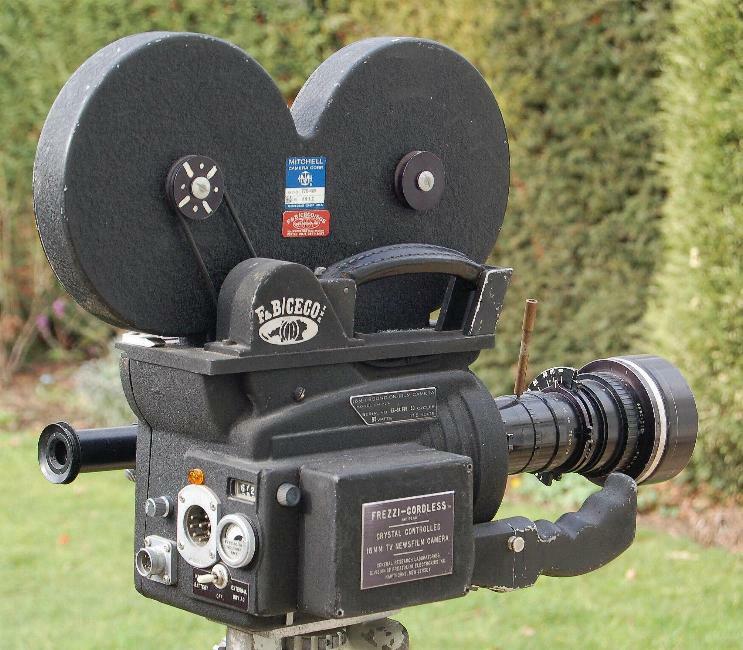 Clockwork 16mm zoom camera popular with budget film producers yet capable of high quality results. Fully practical and complete with all accesories including carrying case. 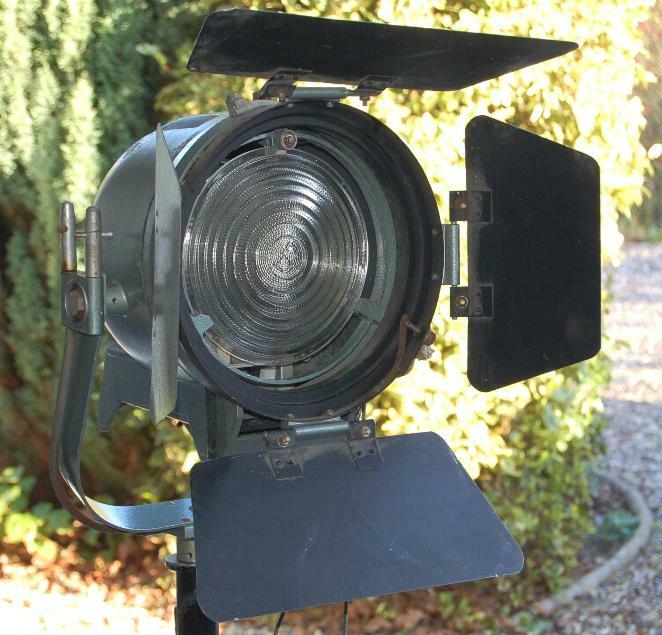 A lightweight 1kw 7" fresnel tv studio light, usually suspended. 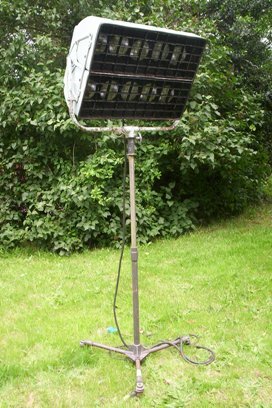 These lights can be adjusted in situ for angle and 'spotting' by pole positioning using the adjuster lugs on the mounting bracket. Very handy to do so from the studio floor where there maybe a 35ft drop. 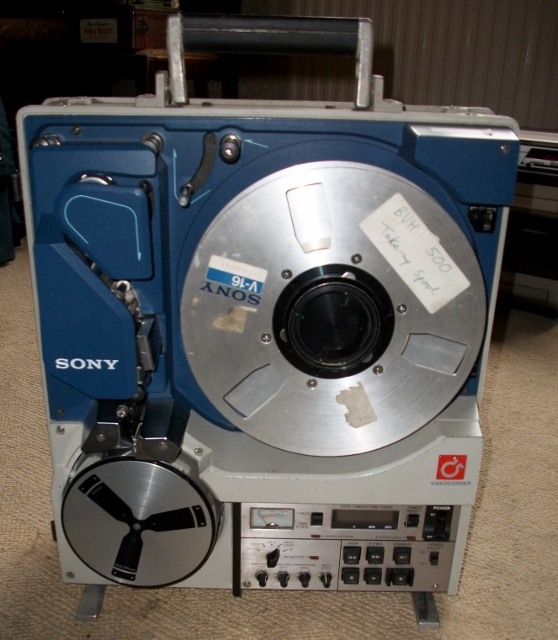 The famous 'BETACAM' design was the popular Sony ENG 'stand alone' camera kit, whereby the camera, power supply and vt recorder (BVV 1PS) were combined in one unit. 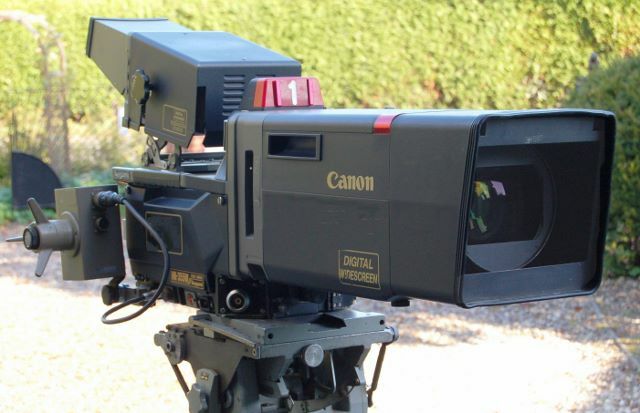 Launched in 1984, this camera employed a single Trinicon tube(Saticon) which delivered upwards of 400 lines of horizontal definition. 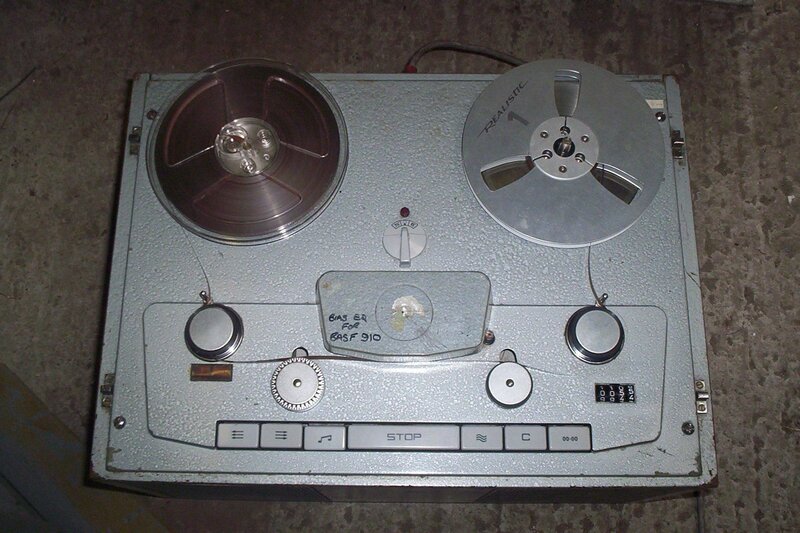 The camera/recorder had no playback capability and so tapes needed a separate player. 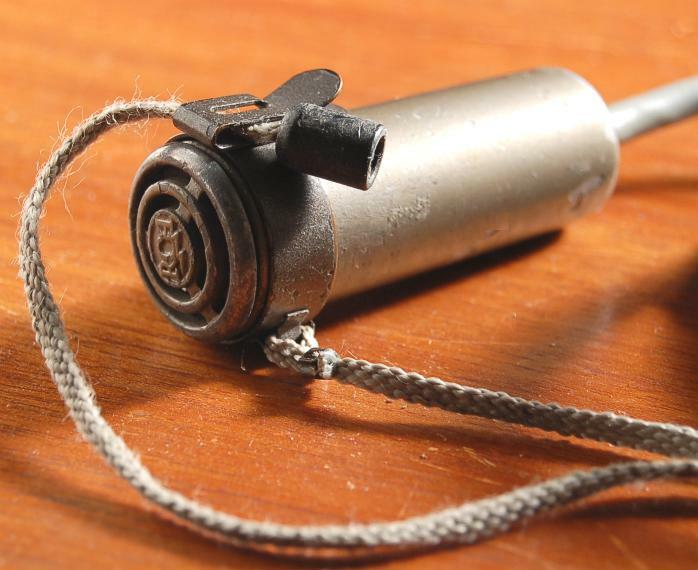 With an adaptor, the BVV 1PS recorder could also be used to record from other cameras. 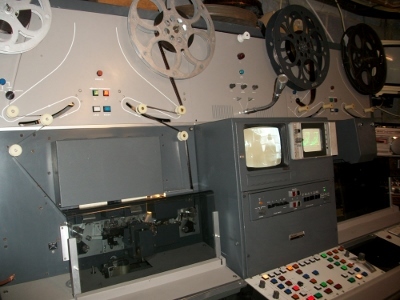 Our Betacam (still in working condition) was used by a regional broadcaster on local news. 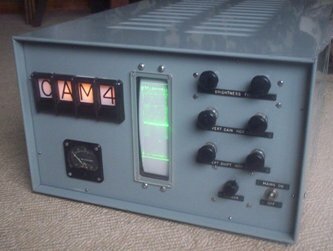 Fully transistorised 4 channel audio mixer for small radio OB or educational studio work. Model number: 843043. Operational. General purpose 5' diameter dish. Can be used as microwave link or satellite Rx/Tx. Alternative centre feed arrangements available. As used recently in 'Hippie Hippie Shake'. Change of colour can be arranged - green or white being typical. 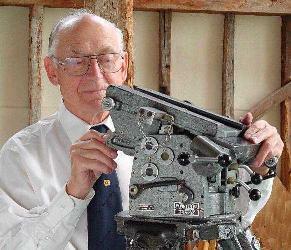 James Frezzolini was famous in the USA for adapting and upgrading Auricon 16mm newsfilm cameras. With distribution by F&B/CECO Inc (Florman & Babb/Cine Equipment Co) these adapted Auricon 16mm sound-on-film (SOF) cameras were known as ‘Crop Tops’. 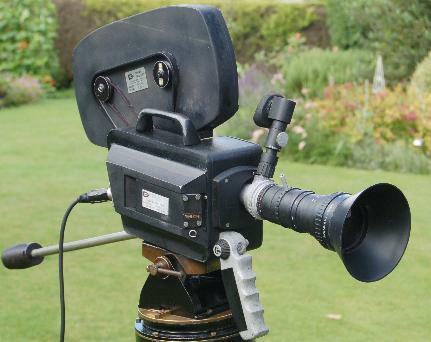 Cameramen preferred the lighter Cine-Voice with its added 400ft magazine. 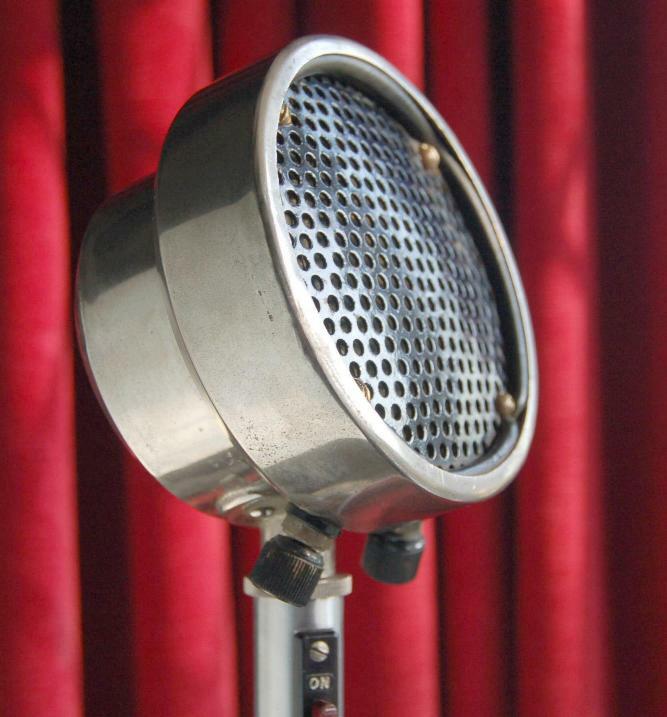 Various Cine-Voice ‘conversions’ were advertised and carried out (in particular by James Frezzolini 'Frezzi-Cordless'), but not by Auricon who refused to adapt their own product. 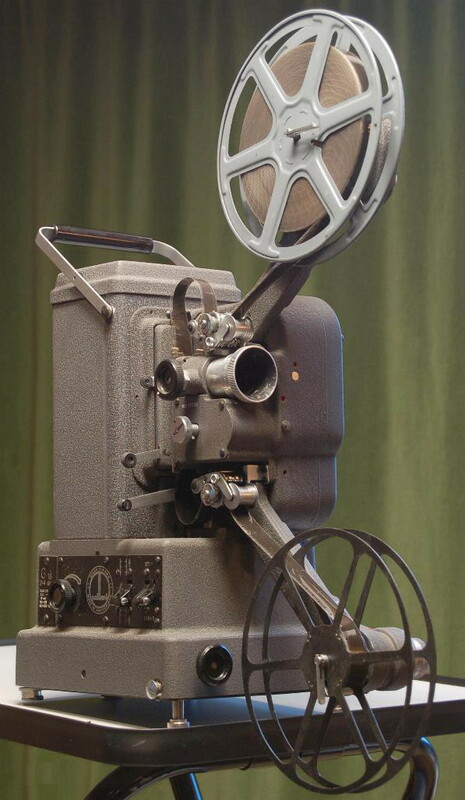 Originally, the Auricon Cine-Voice was only 100ft loading. 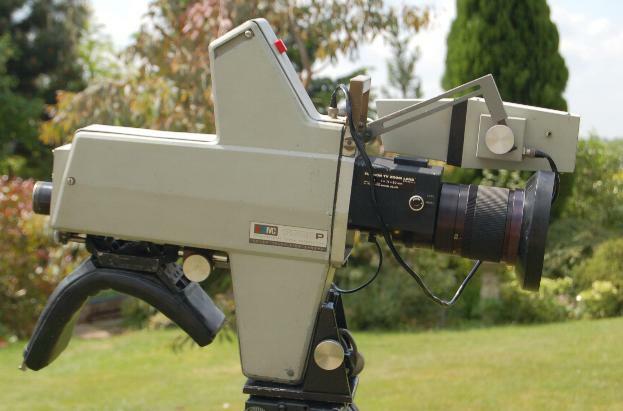 However, with the top 'chopped off' and an added 400ft magazine, the entire camera was now suitable for news gathering and as a bonus, weighed in at only 7 kgs. 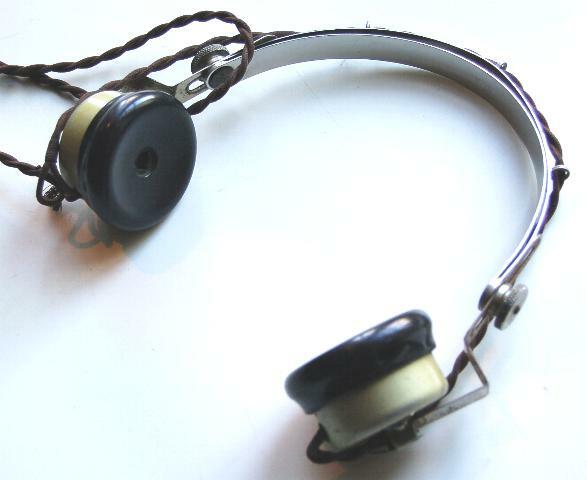 Originally the Auricon had an optical sound head, but later versions used a magnetic head and striped film. Zoom lens by Angenieux 12/120mm f/2.22. 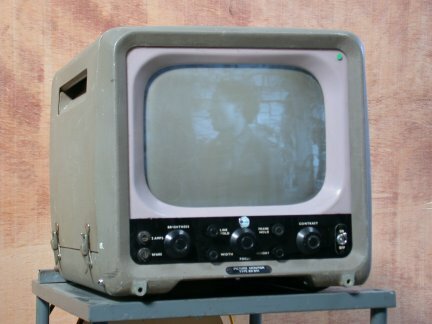 Up-market 26" inch ITT colour television receiver in operating condition. The larger picture shows the receiver 'in situ'. Mid-1970s. 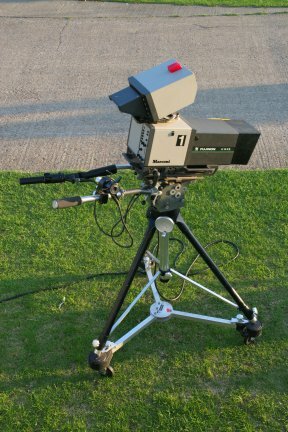 Introduced in 1984, the Sony BVP 3A was a lightweight portable colour camera designed to attach to the BVV 1A recorder creating a self-contained 'ENG' (Electronic News Gathering) unit. 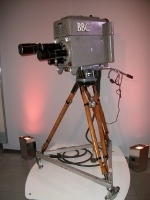 The BVP 3A camera used three 'Saticon' or 'Plumbicon' 18mm pickup tubes delivering '650 lines'. 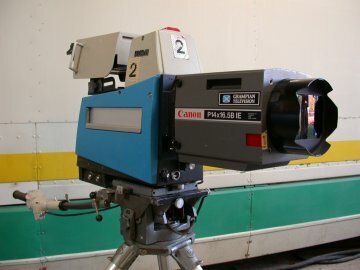 The camera also had an unique system of tube auto-centering without a test chart. 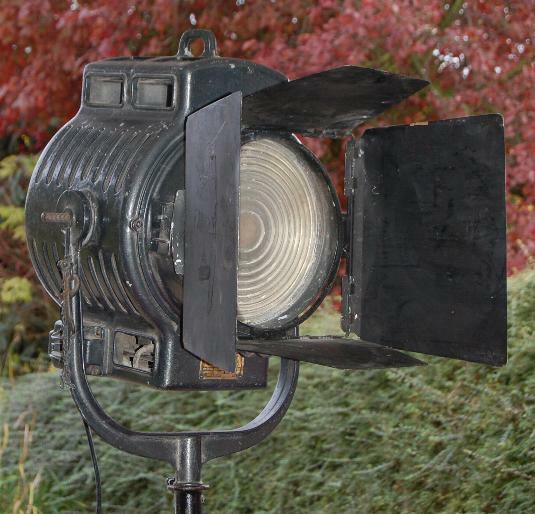 Small portable location (or ENG) lighting, the Ianbeam 800 is generally called a 'redhead'. 800 watts of spot or flood light without the use of a fresnel glass. Portable lightweight stands. 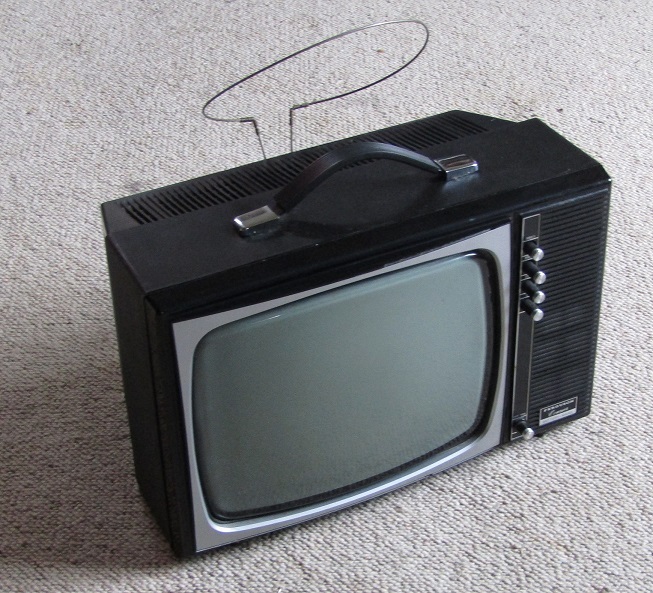 Late 1970s 20" inch colour receiver. 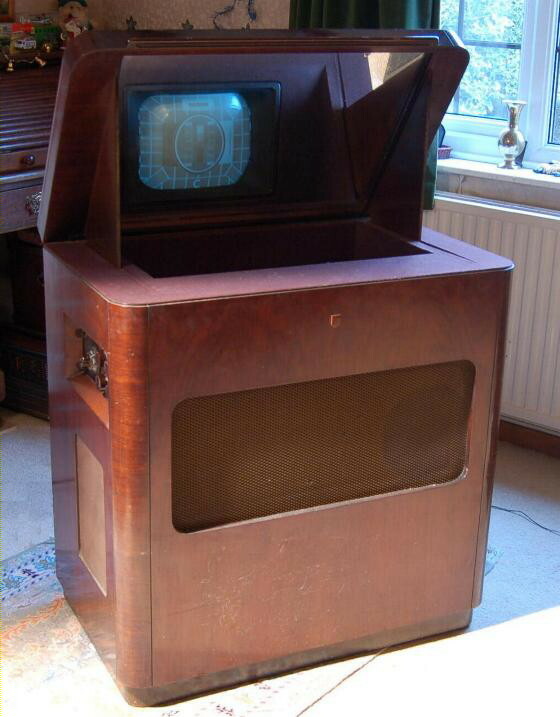 17 inch receiver. Late 1960s wooden item. 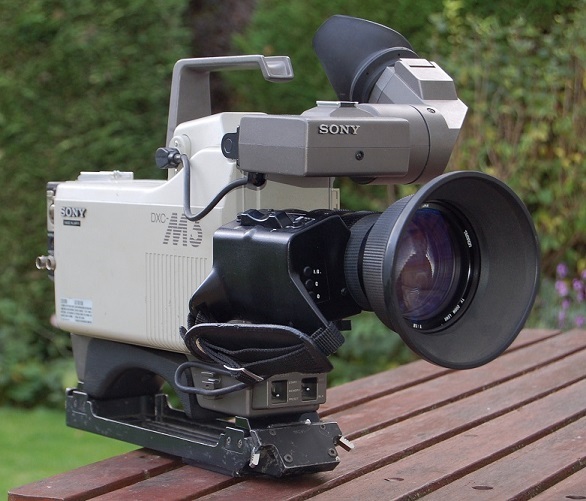 This 1992 vintage SONY BVW 300AP 3-ccd camcorder (Beta SP type) was a firm favourite with news gatherers and production companies. Our 4:3 aspect ratio example is in working condition. 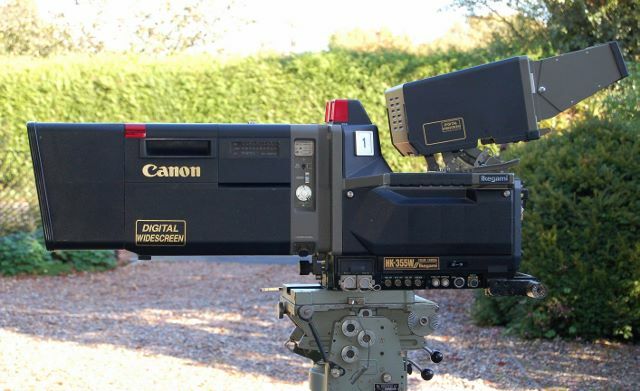 The IVC 7000P was described (with hyperbole) as 'setting your cameraman free'. Free, possibly to encounter back strain. 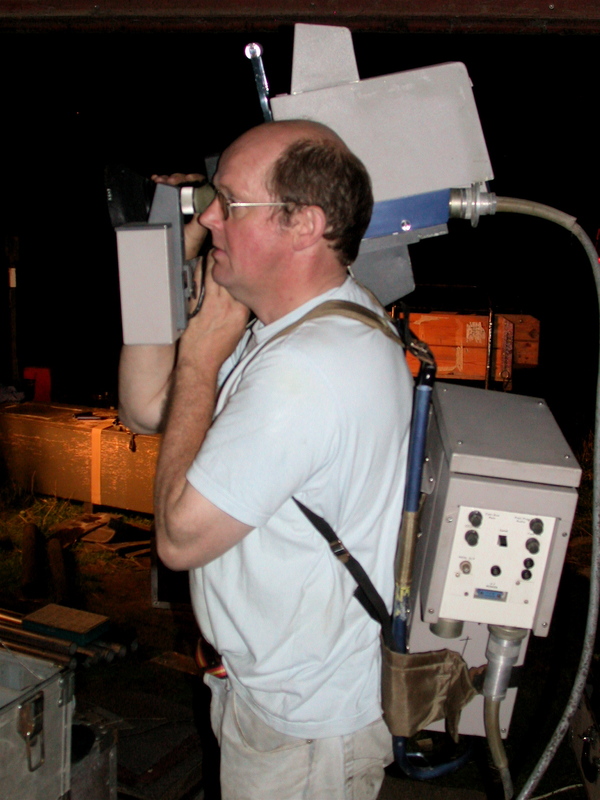 No little weight, this mid-1970s 'portable' three-tube lead-oxide colour camera came in at over 12.5kgs (not the 7 claimed) and that was without the 'control backpack' unit which added at least another 12 kgs. 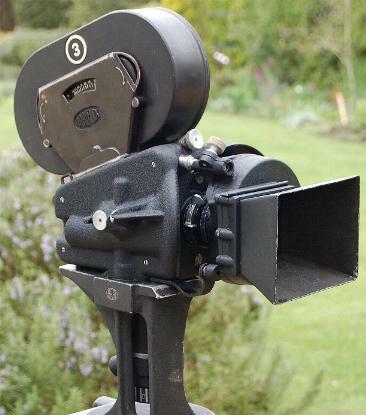 The camera was tethered by a polypole cable and had an optional 'Studio Adapter' rig with a 7" inch viewfinder. 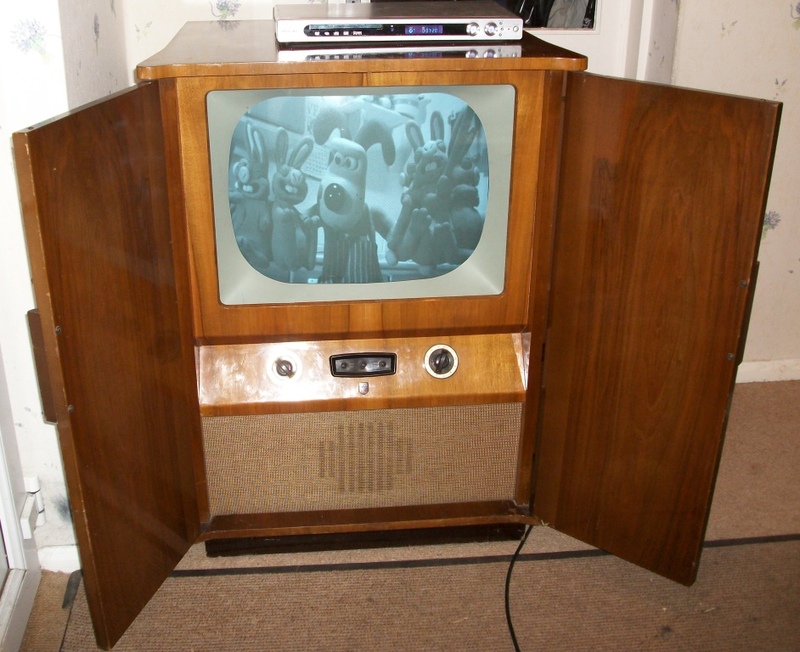 UK users included Anglia TV, Grampian Television, Thames Television, Southern Television and LWT. One of our cameras was used by TVS (TeleVision South) and the other by a facilities company. 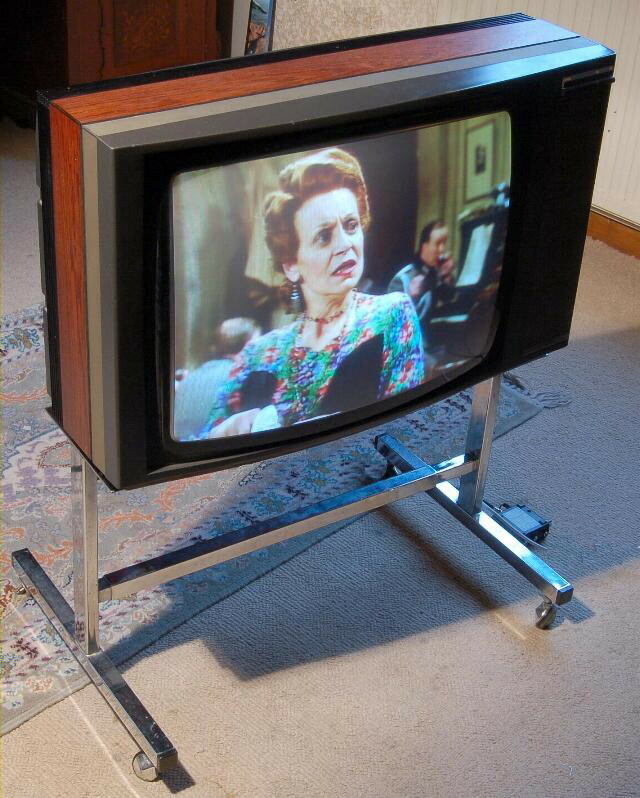 The IVC 7000P picture quality was described as 'awful'. Iconic Sony colour TV using the famous 'Trinitron' tube. In excellent working order. 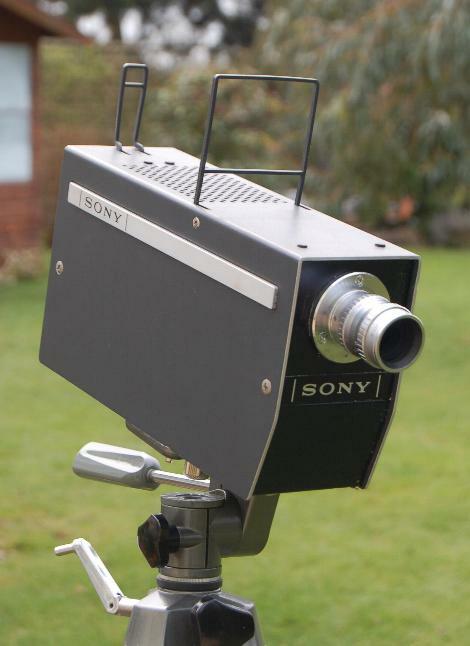 Also available: the famous Sony 'dish' set-top aerial. 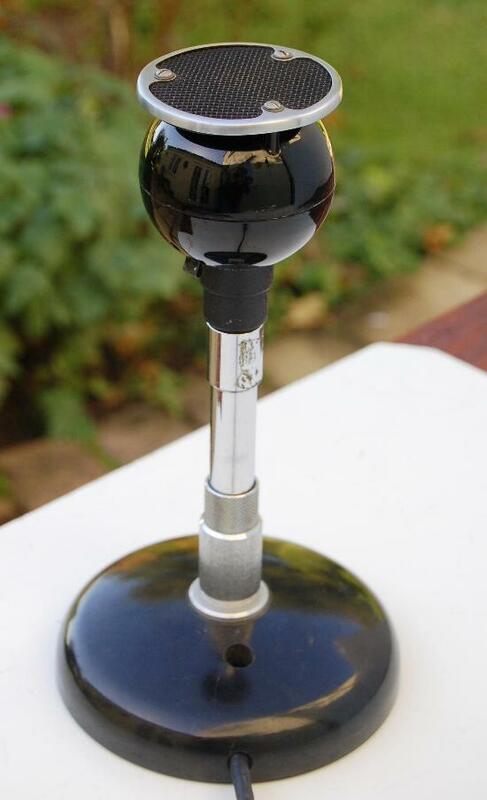 Stylish black and white set on monopole stand. Very 'swinging 60s'. Good working order and can be supplied with miniature 625-405 converter. Very common 'Thorn 1500' chassis black and white 625 only set. This one carries the 'HMV' brand and is in full working condition. It has a broadcast illuminant 'D' tube fitted to reduce the colour temperature for film work. 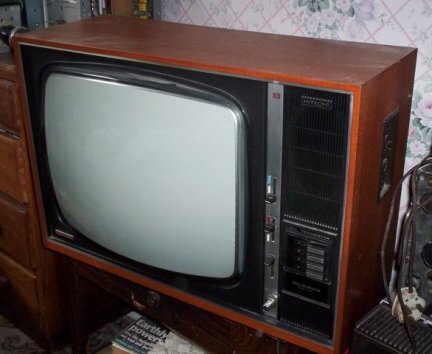 Up market 'Beovision' 7702 set in full working order, complete with remote control. Useful-sized picture monitor from JVC. Nice sharp picture. 14" inch screen. Sound input/output. 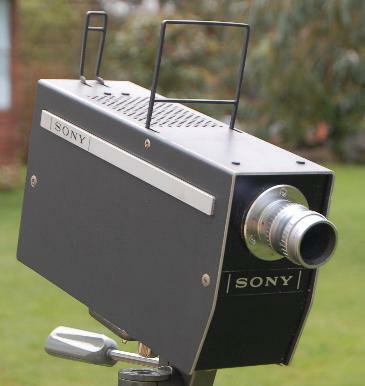 Sony's Consumer Video camera from 1965, part of their reel- to-reel monochrome 'home video' taping system (1/2" inch tape running at 12" inches per second). 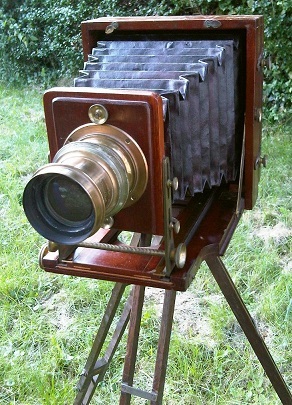 Note the cameras' very basic metal frame 'viewfinder'. In fact this system, which retailed in the US for $695, was used mainly by business or educational establishments. We also have the matching VTRs. 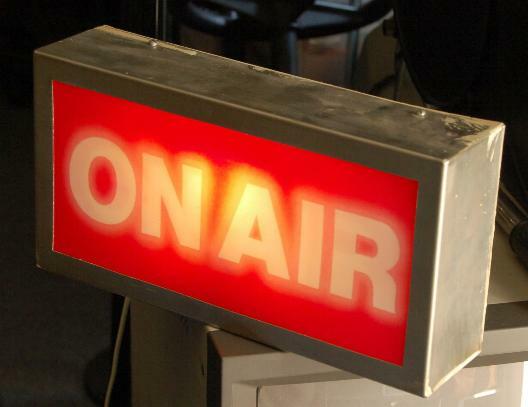 For broadcasters on a budget - a quality vidicon camera for use in cost conscious studios and for applications such as announcing. 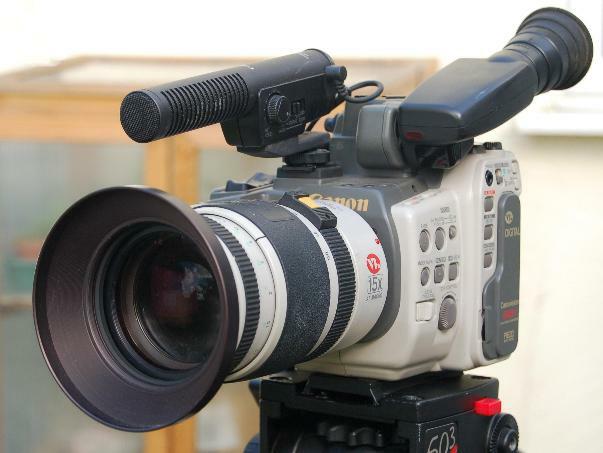 The camera is novel in having a built in waveform monitor as well as the viewfinder. This facilitated 'one man' operation. Click on the image to see the rear aspect. 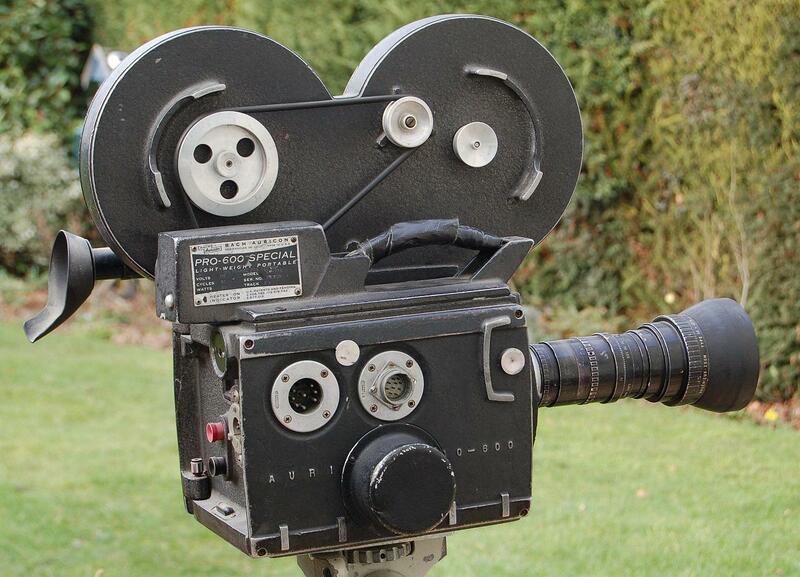 Not strictly a 'broadcast' camera, but certainly a quality vidicon camera. 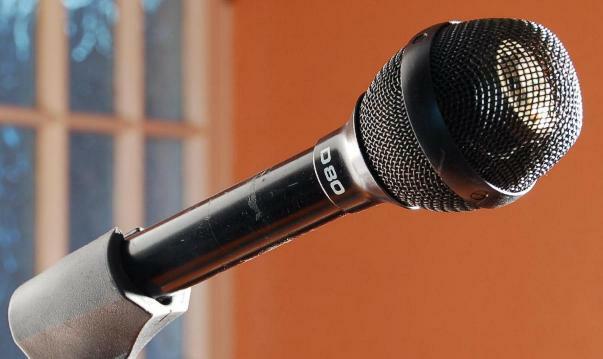 The V322 was intended for industrial and educational studio applications and saw widespread use with educational bodies and in corporate training/promo facilities. Not to mention a few broadcasters too! 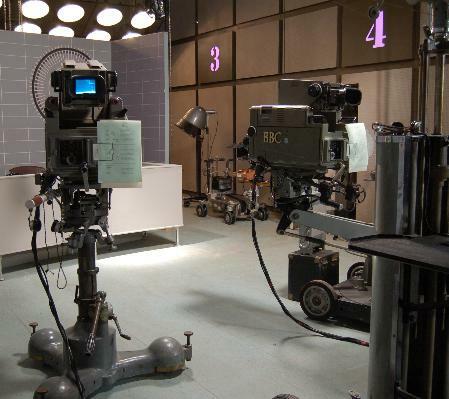 The camera appears here on a 'Dennard' pedestal. Click on the image to see the reverse aspect. The Mk 7 Vinten pan & tilt head was the culmination of the 'gravity' balanced system using cams and risers to achieve a tilt 'without effort'. 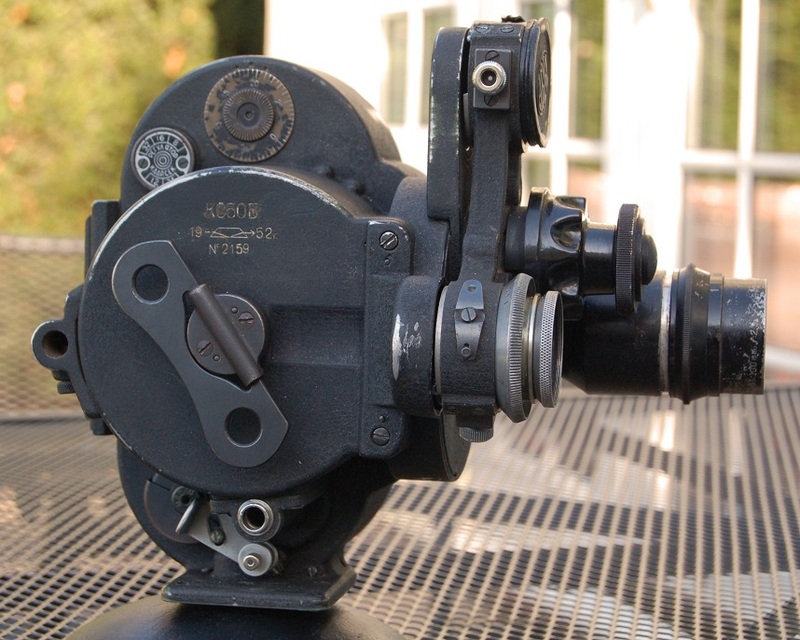 The Mk 7 pan head is still in use worldwide. Say no more. 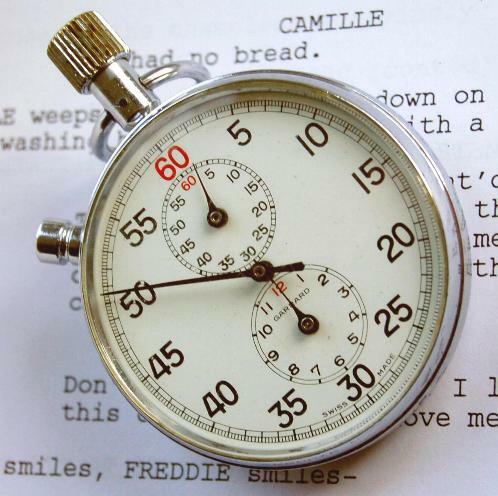 Genuine ex-BBC programme production Stop Watch. 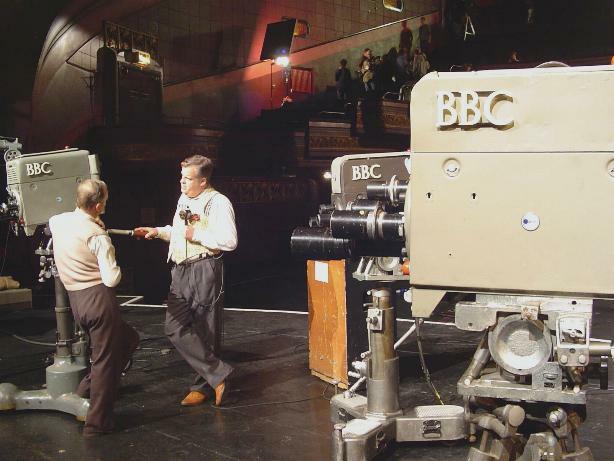 Familar sight in the hands of PAs in tv galleries or at rehearsals. 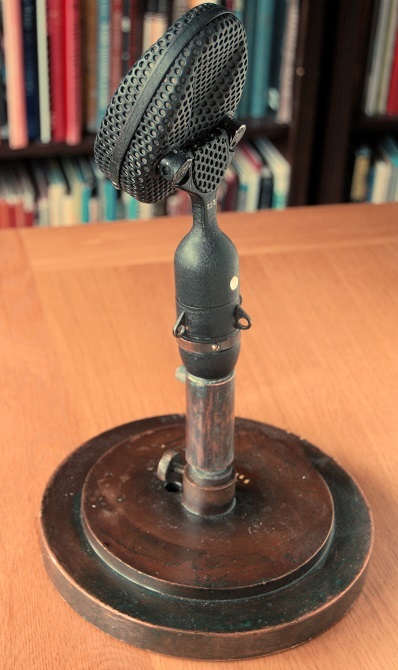 This Nero Lemania is in full working condition. 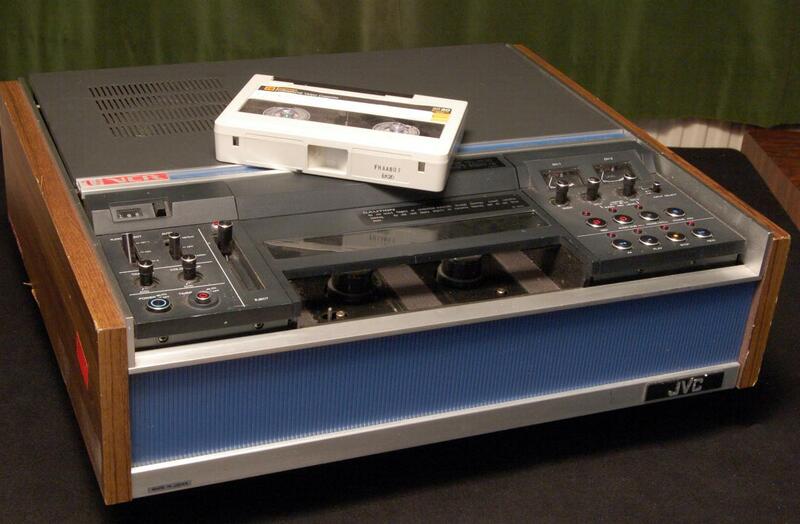 Half-inch, colour capable Video Cassette Recorder, introduced in 1972. This immaculate example is operational, comes with the original soft cover, many tapes and the original manufacturer's cardboard carton. Intended for the domestic, corporate and educational markets, the original cost in 1972 was about 600 UK Pounds. 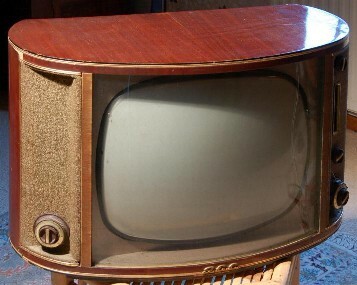 Swedish made, upmarket 26" colour TV. Plastic dark wood cabinet. Comes complete with the original stand and remote control. Good and reliable example of later PIL (Precision in Line) CRT technology in almost 'as new' condition. 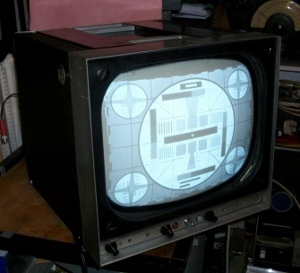 An ex-Granada Tv chronograph. Working condition. 1960s/1980s. The AVC 3200E is a monochrome Vidicon camera,used during the 1960s principally by the corporate, scholastic or industrial market. The camera was intended to link to a (reel to reel) video recorder. Our example currently is not in working condition. Clean, 1960s Kodak Brownie 'Standard' 8mm projector with 200ft spools. Non practical condition. 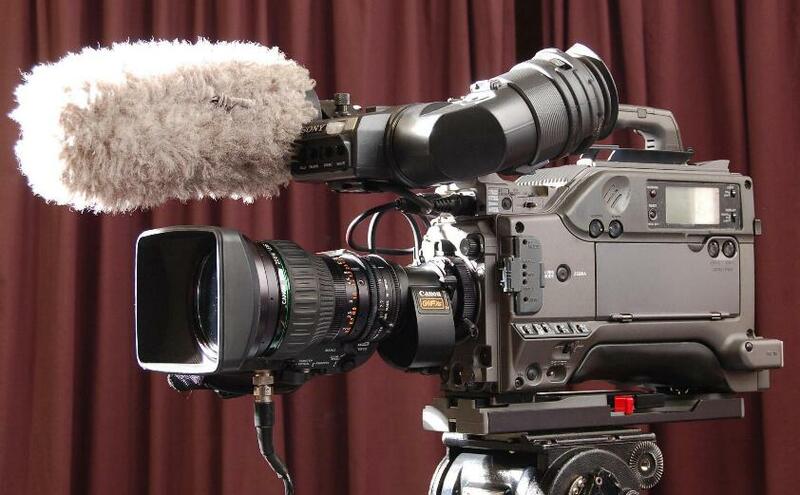 Top of the range SD DV camera with Canon VRSE SX12 zoom lens. 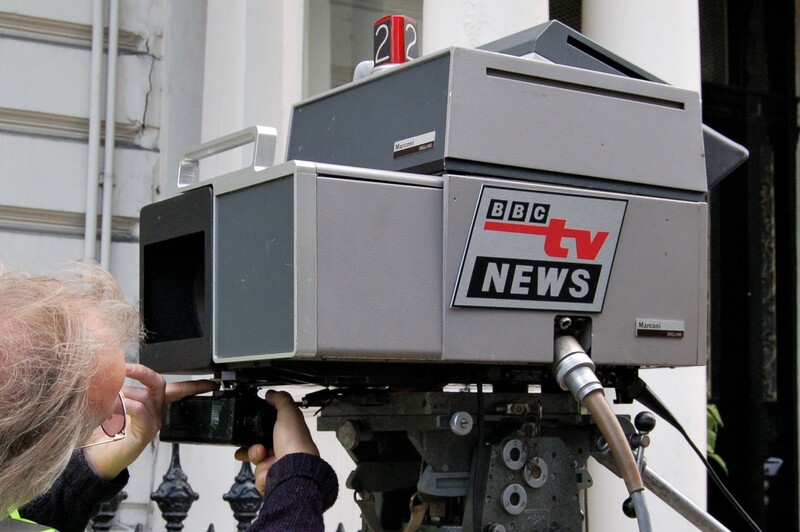 4:3/16:9 image, these cameras were the mainstay of BBC Broadcast throughout the 2000s. High quality standard definition images of 700 lines plus. 3hrs recording on a DVCAM cassette. Larger image shows studio rig. Nicely balanced and compact pan and tilt head from Vintens. Good for ENG work, which is for what it was designed. 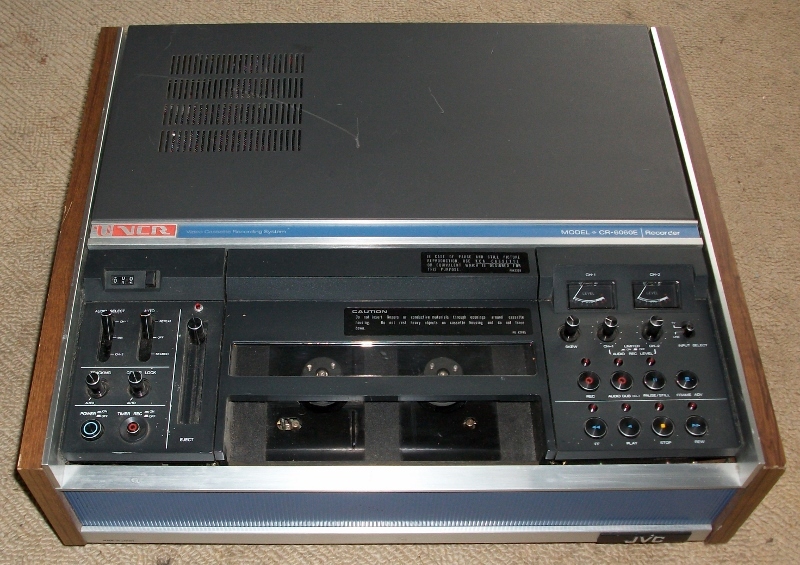 Portable Betacam video recorder/player from the mid-1980s. 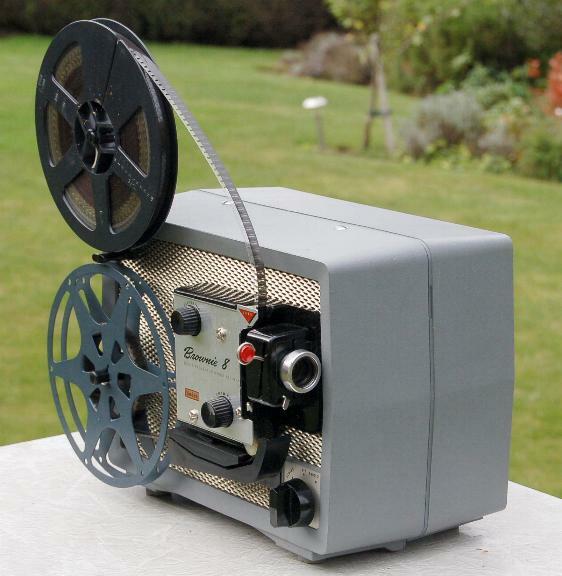 Designed for ENG or 'field' recording and playback using the standard Betacam tape format. 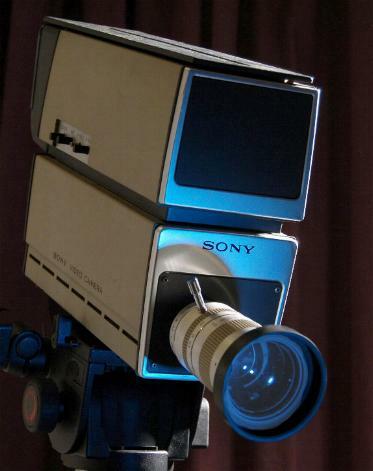 Interfaces with Sony cameras. Carry case. Lights come on. High quality 20 inch black and white unit. Fully operational and excellent picture. Very common in UK galleries and on the studio floor. General purpose medium resolution 14 inch colour monitor. Found in galleries and OB trucks in most UK broadcasters. Three fully operational units available. 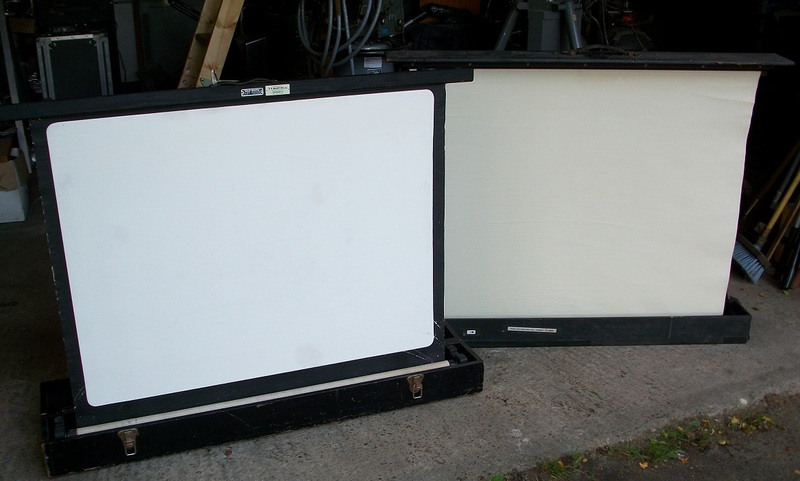 Basic, general purpose small screen monitor for use in gallery stacks and OB trucks. Most have illuminant D white phosphors. Excellent quality monitor found throughout most UK broadcasting studios and OB trucks from the 1960s to the early 1980s. We have 18 fully operational and reliable units which are ideal for creating monitor stacks. Also available in 11 inch size with at least 10 units in full operational order. 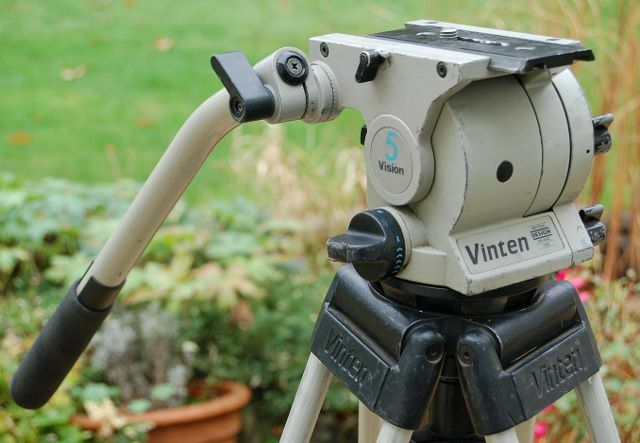 Lightweight pan head from Vinten. Melford 12 inch monochrome monitor. Good picture. 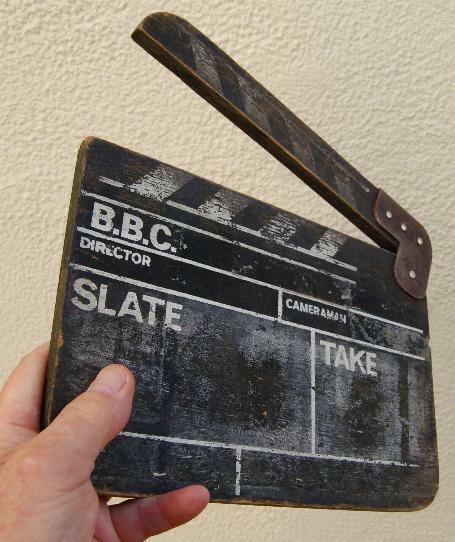 Used in tv galleries. 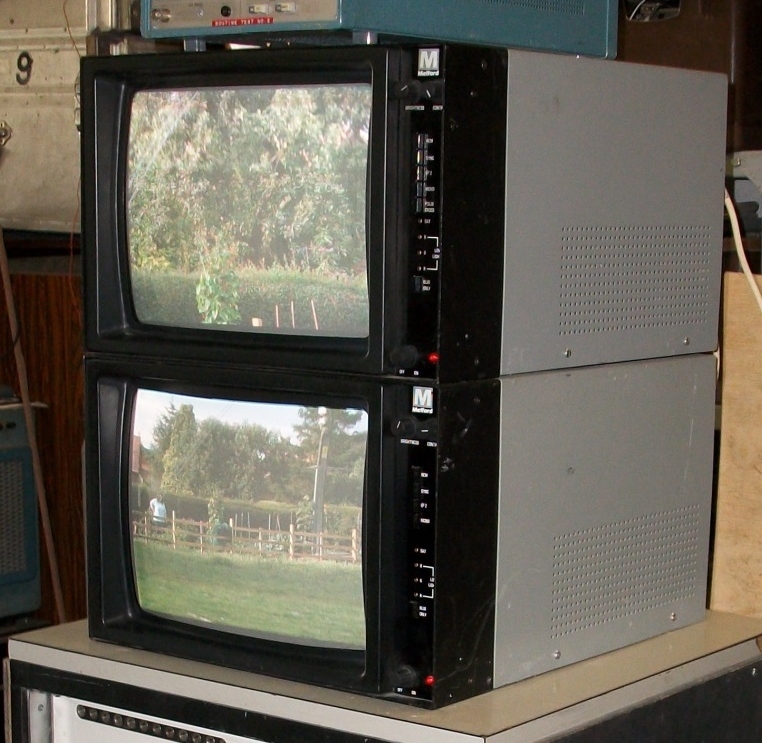 Distinctive yellow/cream coloured cased or rack mounted colour monitor designed for general purpose broadcast use but usually found in VTR monitor bridges. GATV has 2 fully operational examples. Truly portable quality - C Format on the move. Reliable field production VTR. Fully operational. The alternative to Sony for U matic. One example is in super condition and records/plays well (at least as well as a low-band unit could). The second unit is untested but will probably work. 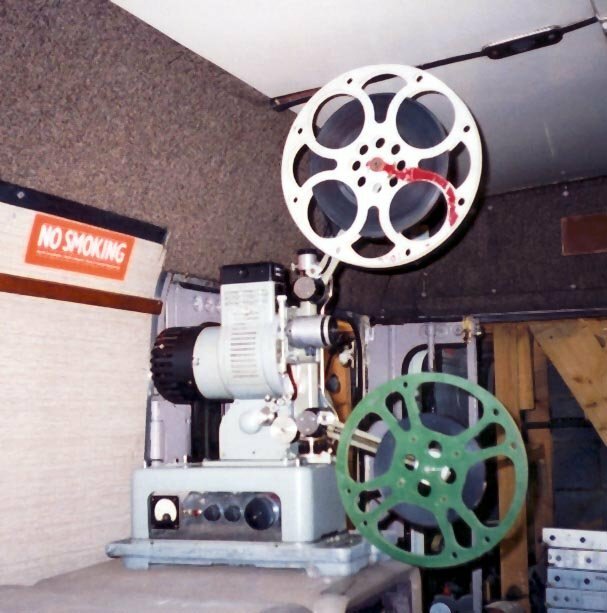 One inch helical VTR before C Format. 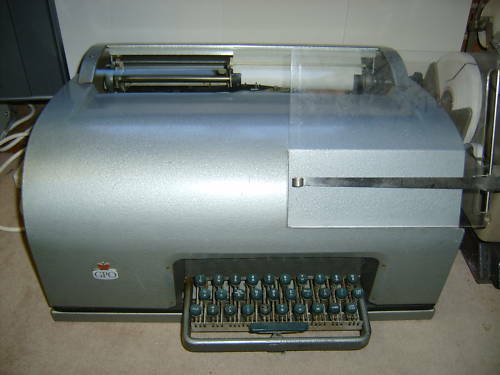 Popular machine, although limited in performance compared to later 1 inch formats. 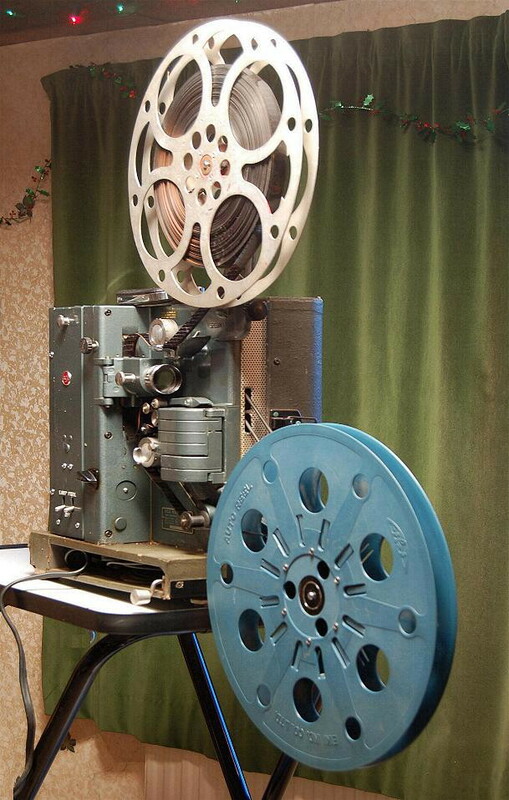 Before all-electronic editing, physically splicing 2" video tape was how it was done. 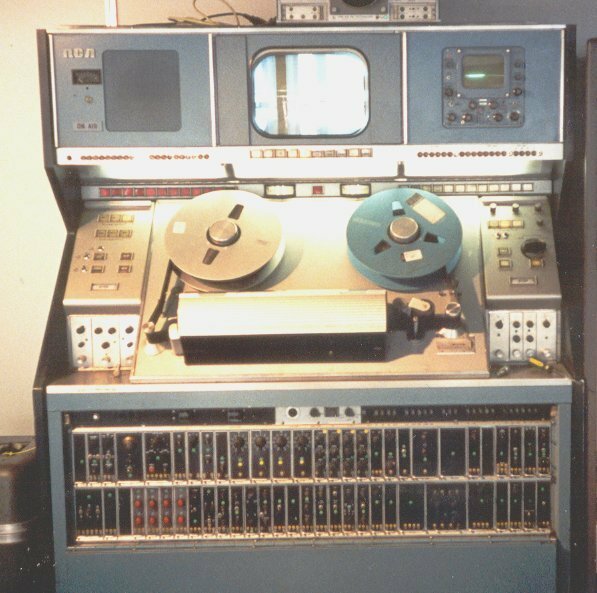 This is a machine that enables the vertical blanking period in the recorded FM video to be identified and a precise join carried out. A budget CCTV camera for general applications. Cost the princely sum of 91 UK Pounds in 1965 (about a 1,000 Pounds today). 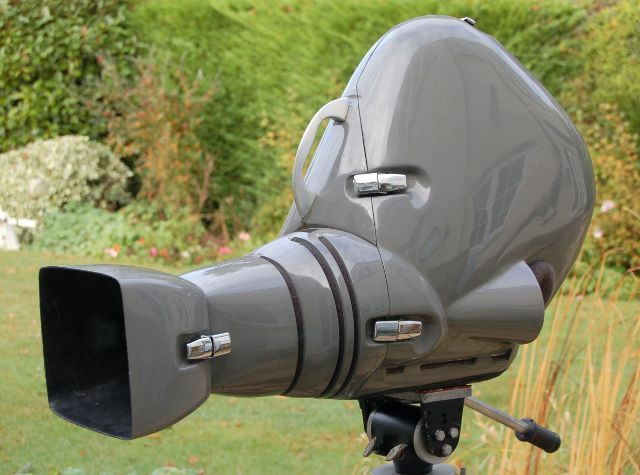 An unusual looking camera but so 1960s! 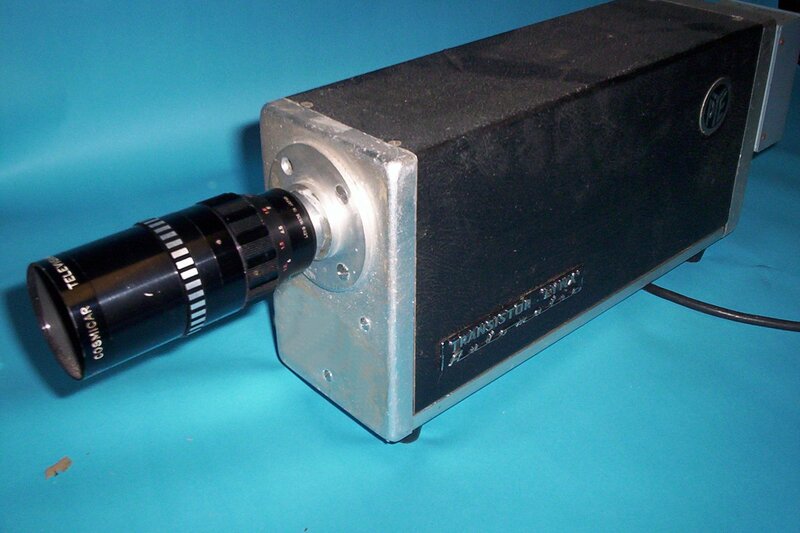 Custom CCD implant camera into Ikegami HL79E using an original lens. 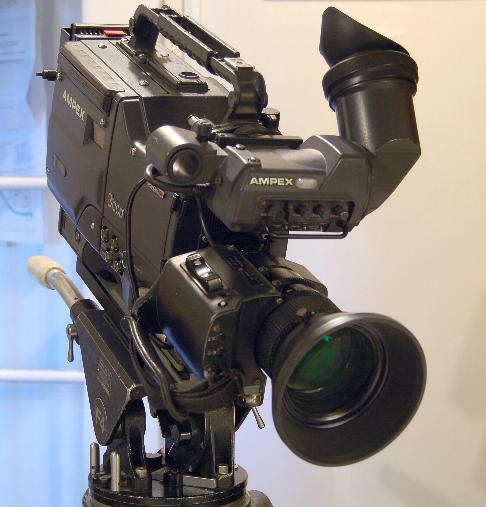 The camera is powered via a custom Triax base station and the video is sent via an RF carrier. Golden Age TV re-created TV gallery for the BBC's 'Adventure in Space and Time' about the origin of the famous Dr Who series. 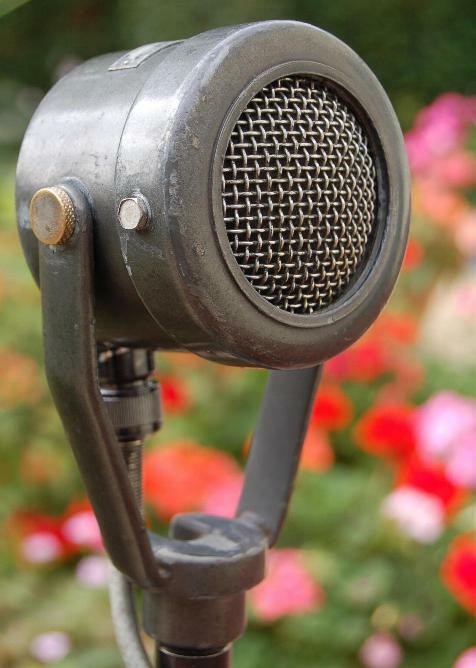 For many years, the DT 109 has been the standard headphone/microphone combination for remote broadcasting, studio, film, TV and language laboratory application. 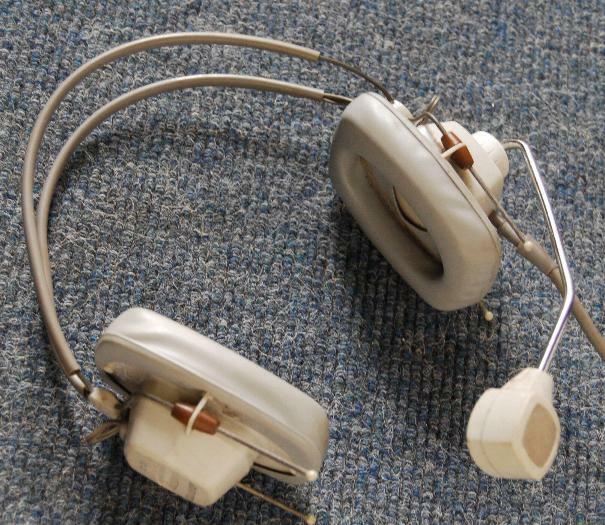 The headphone transducers offer tailored frequency response to improve speech intelligibility coupled with excellent isolation from ambient noise. 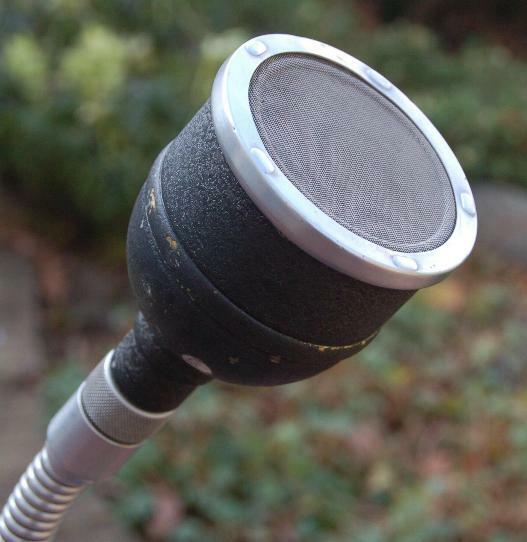 The adjustable, noise-cancelling microphone provides clear and audible speech transmission for either live commentary or talkback applications. 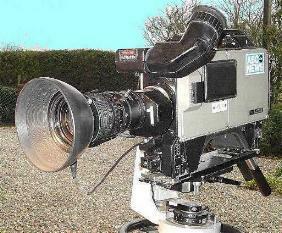 High quality Ikegami HK 355PW true widescreen 16:9/4:3 switchable CCD colour video camera from the early to mid-1990s. Standard definition at approx. 700 lines of horizontal definition. These cameras can run stand alone or Triax connected. 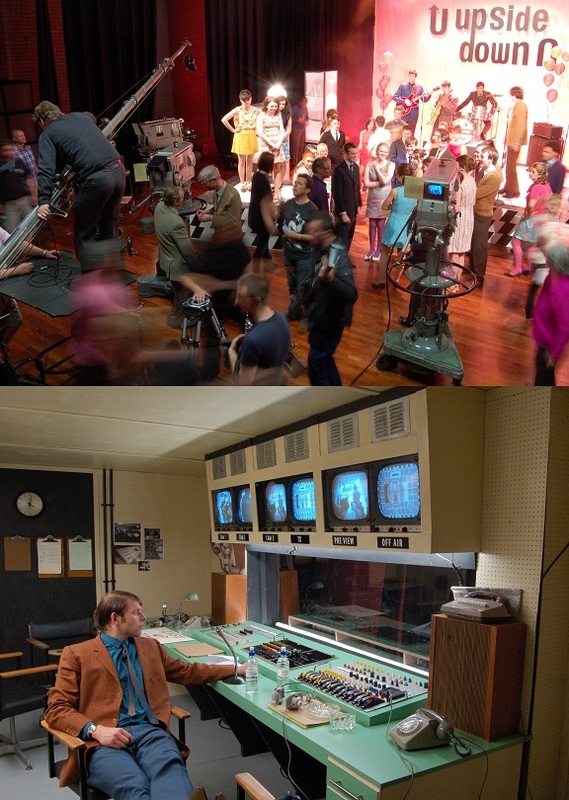 Our example was used by Thames/Teddington Studios. 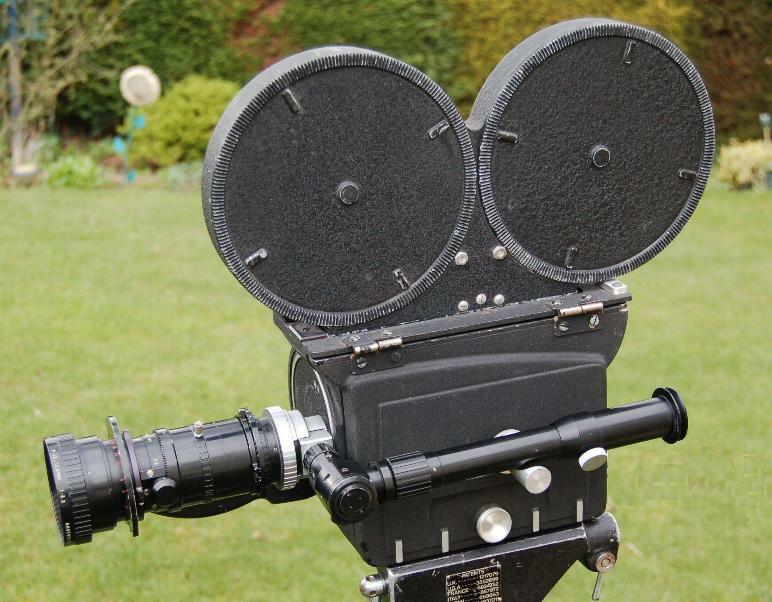 Manufactured by Better Sound of London, this dedicated sound blimp was used for Arriflex 16mm film cameras. 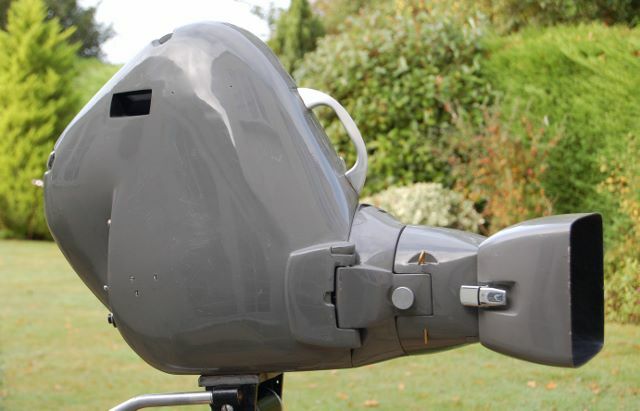 This blimp is of a striking and 'futuristic' design and far less weighty and bulky than our all-metal Arriflex version. High quality Ikegami HK 355W true widescreen 16:9/4:3 switchable CCD colour video camera from the mid-1990s. Standard definition at approx. 700 lines of horizontal definition. 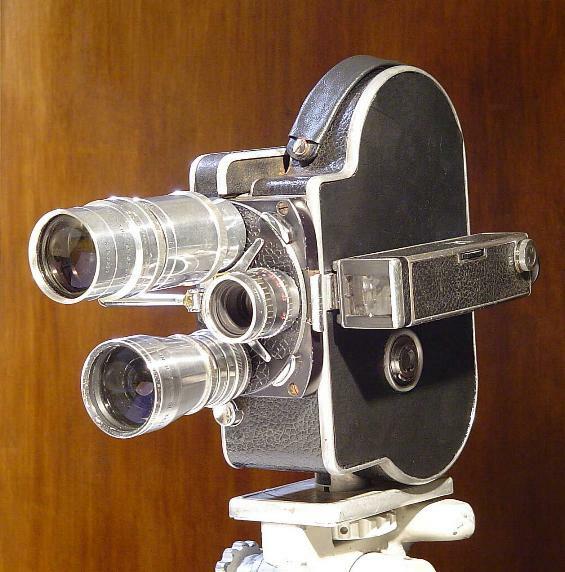 Dedicated full-colour viewfinder. 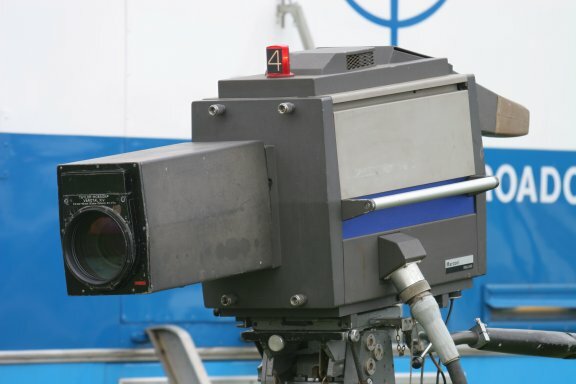 These cameras can run stand alone or Triax connected. 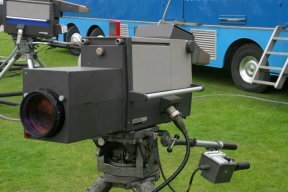 Vivid looking moderate-sized tv camera from Sony, a Trinicon single colour tube camera aimed at the semi-professional or industrial/education market. Not in working condition, prop use only. 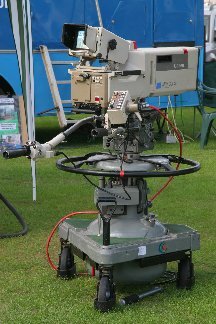 Another Sony portable video ENG type camera, a Digital Betacam 'Digital 1000' using 40 minute tapes and digital image processing with a Power HAD sensor. Our example dates from 1999 and is in working condition. 4:3 aspect ratio only. Nice, sturdy Italian-made tripod and pan head. In some ways superior to an equivalent Vinten product. Large and easy to fit slide-on camera plate. 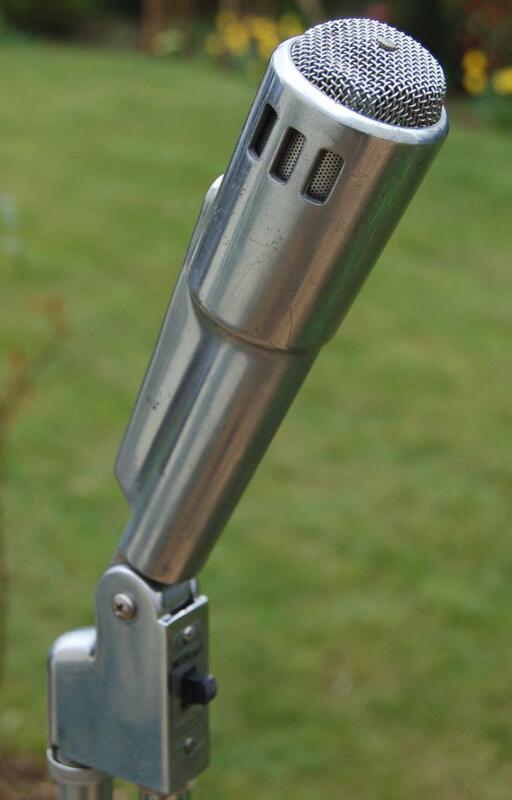 Self locking legs, height adjustment and removable rubber feet. Tilt stay. Very smooth action all round. 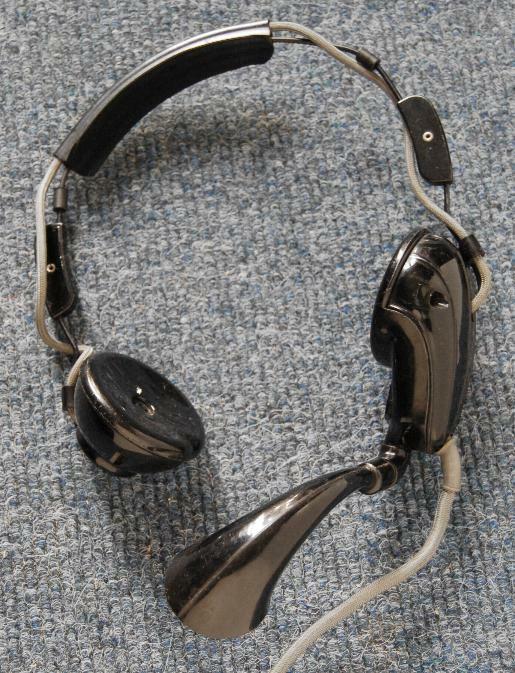 A pair of Sony DR 3A stereo headphones, 1960s vintage. 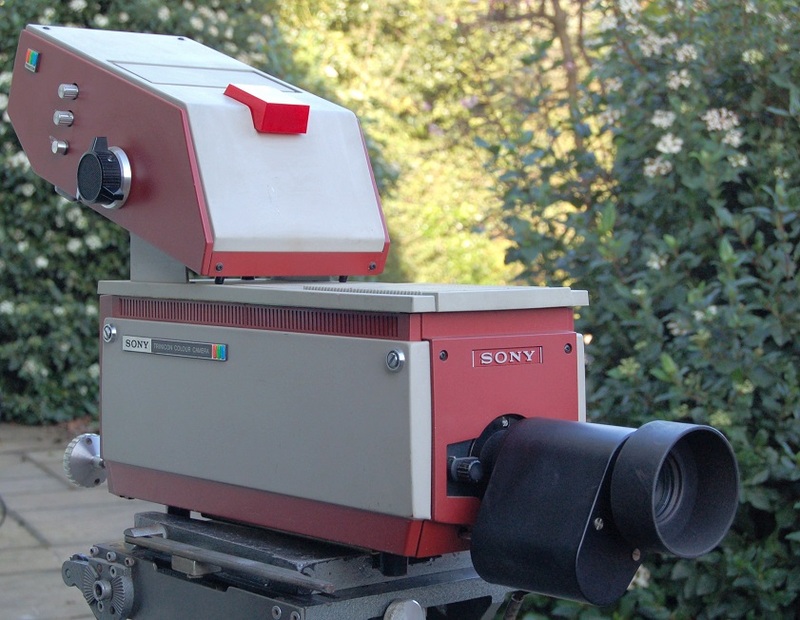 Another Sony 'Betacam' variant. The SX digital system. 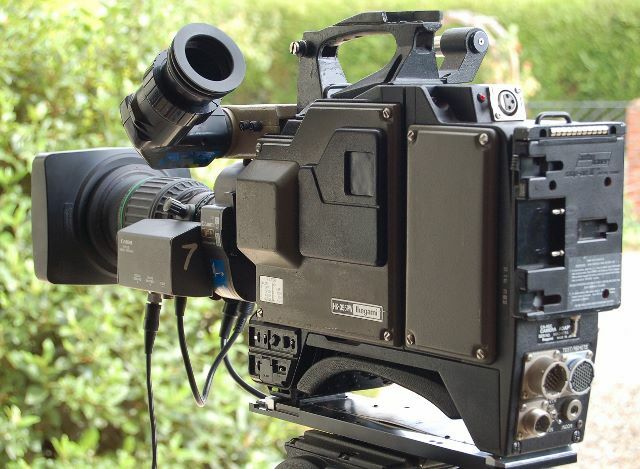 This camera is SD 16:9/4:3 switchable. Used previously by BBC Television News. Not in working condition. 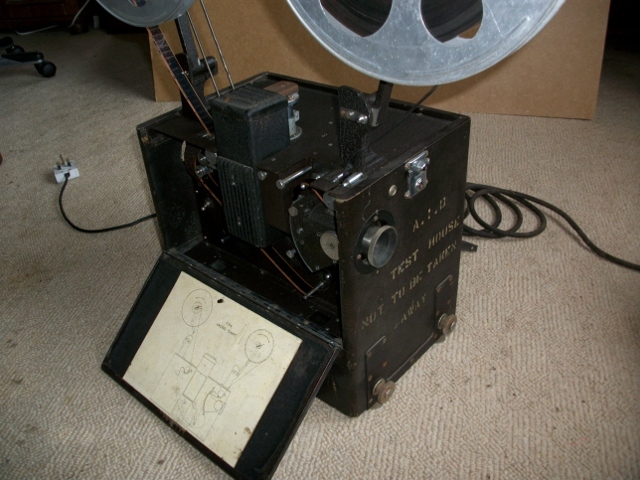 Photoconductive telecine based on the live Marconi MkVIII colour camera. 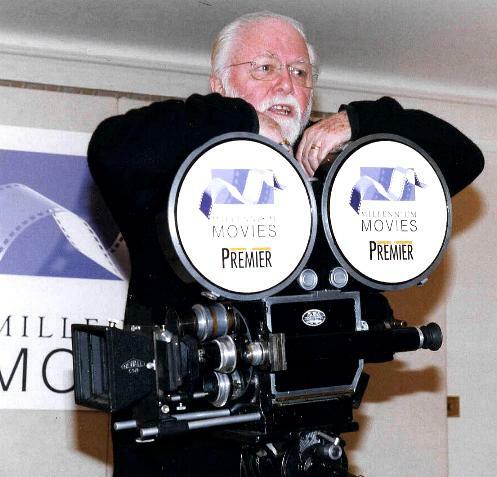 Offering dual film transport (dual 16/35mm or combination) and dual 35mm slide changers. 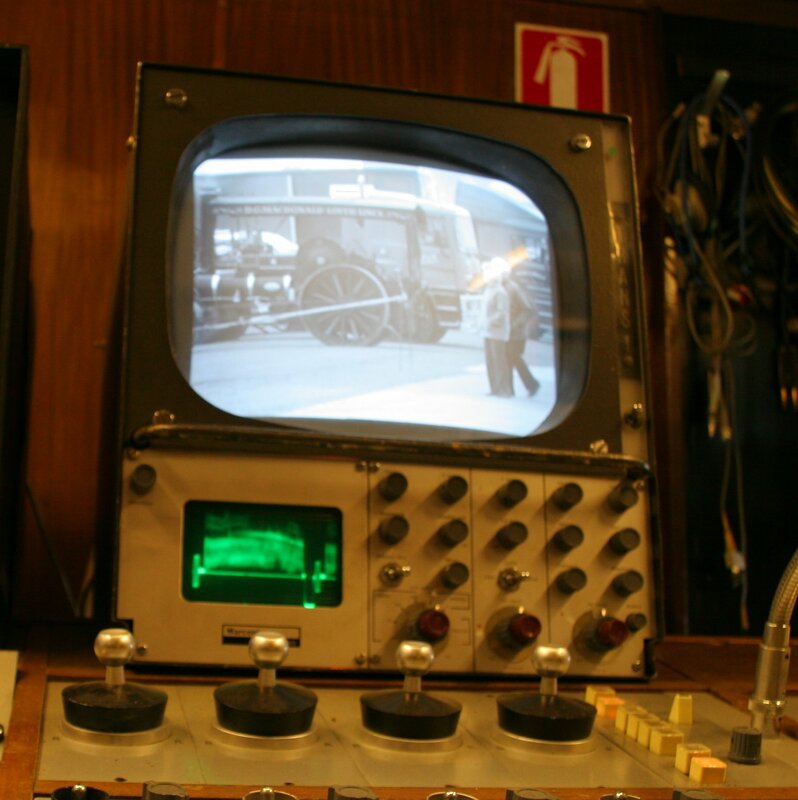 This example is operational and probably one of the last working examples of colour photoconductive telecine anywhere in the world. 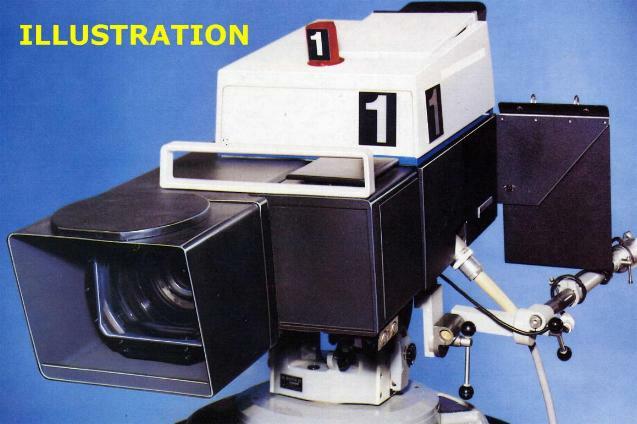 Compared to the higher image quality flying spot type, such machines were well suited to scanning dense news film with economic running costs. 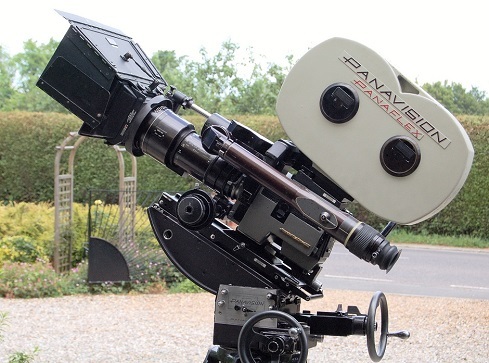 The PANAVISION Panaflex range of reflex 35mm movie cameras was introduced in 1972. 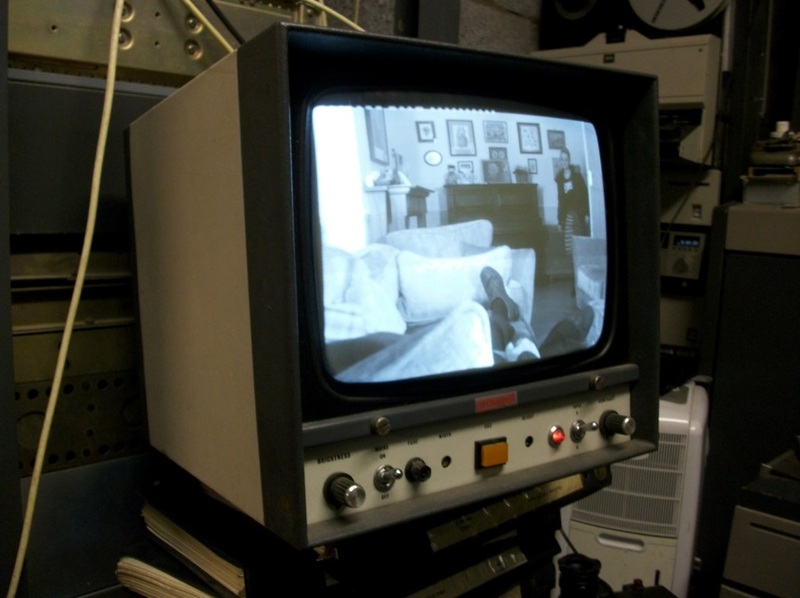 Our example is a GII from 1987 which has video assist built in. The camera comes complete with a Super Pana zoom Cooke 25-250mm 10-1 lens, ray shield and dedicated cradle pan and tilt head. The camera rig can be either tripod or crane mounted. We have exclusively, one each of this camera type in our stores, North and South. Hire possible but under strict terms. 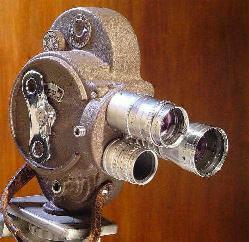 Please note this camera is not in workable condition and as such cannot be used to actually film with. 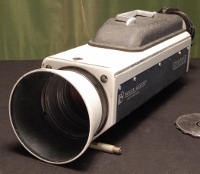 Basic 'Prosumer' Sony three-tube (Saticon) colour camera from the mid 1980s. Auto line up and a few functions including auto white and auto black. On screen menu settings available. Zoom 8-128mm Tamron f/1.6-22. 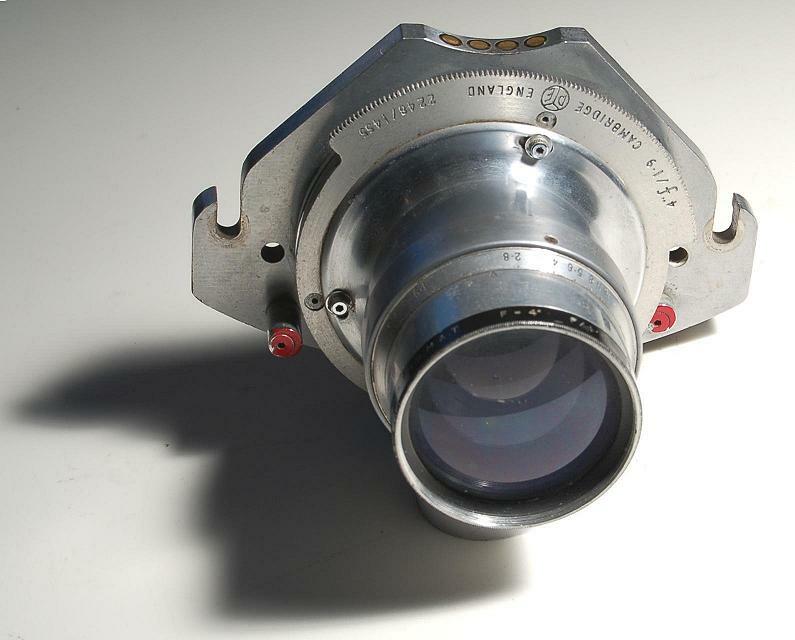 Optional top mounted viewfinder Working condition. 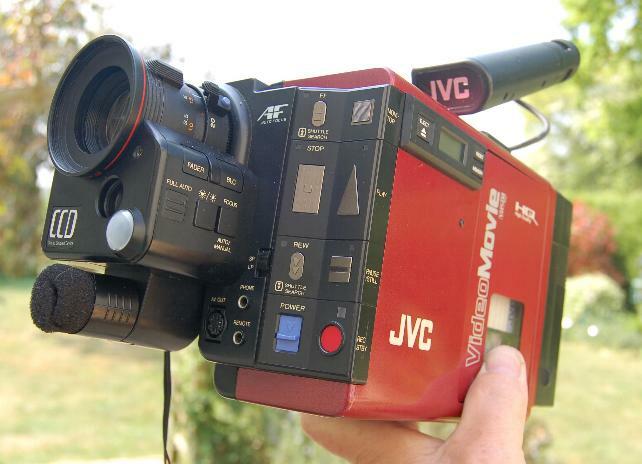 Chunky and heavy JVC Video C format (ie chopped down VHS)camcorder from the 1980s. Nice red colour. Another version available. All non working. 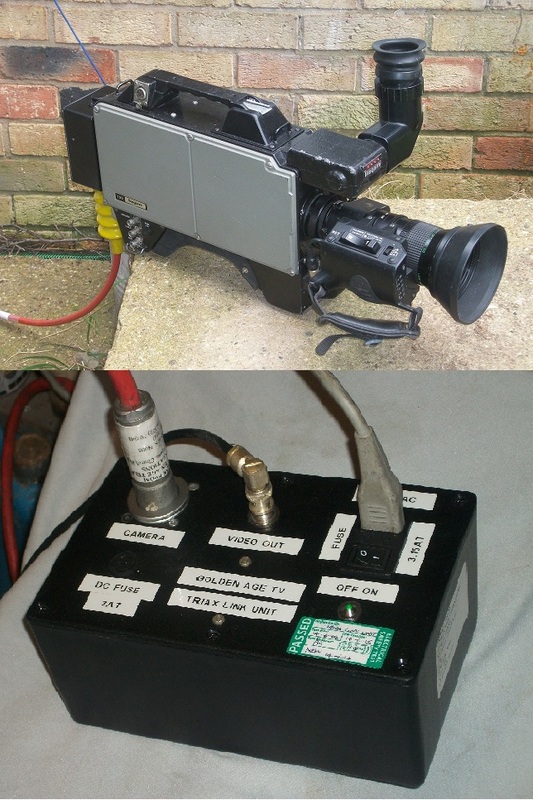 Very compact portable amateur video filming kit using the 'Video C' VHS system and a very basic Saticon tube camera. Late 1980s design. 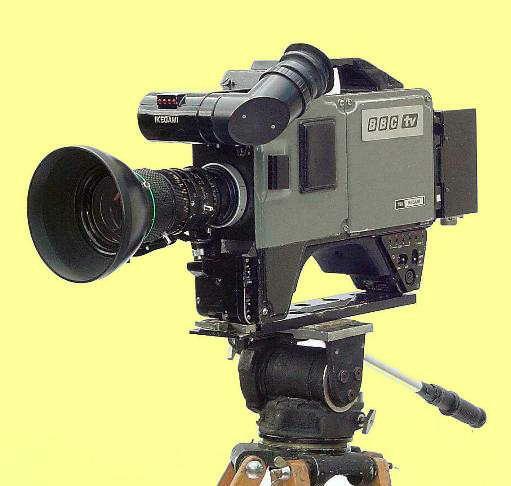 Upmarket amateur lightweight SUPER VHS video camcorder, shoulder-mounted. 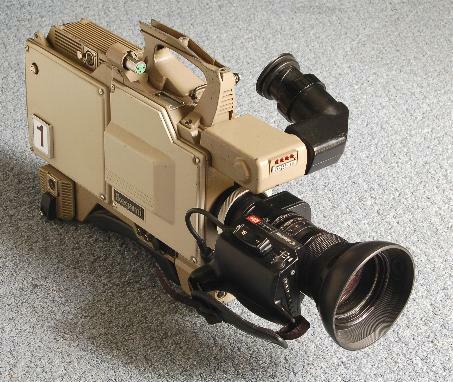 Used also as a low cost ENG camera by local tv stations. Educational or corporate usage. 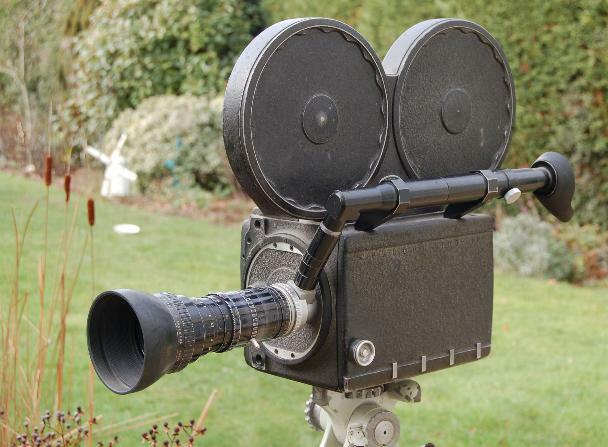 The camera records on a full-sized VHS tape. 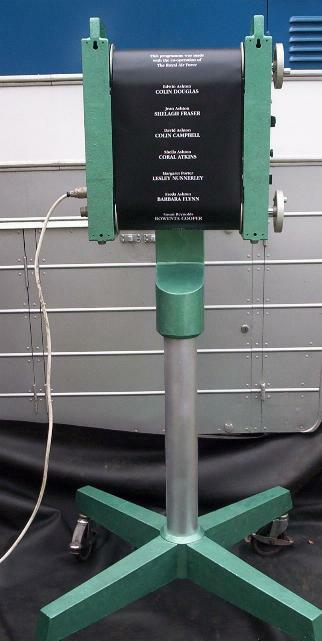 Handy portable pedestal that is air balanced. Can be charged by pumping the column. 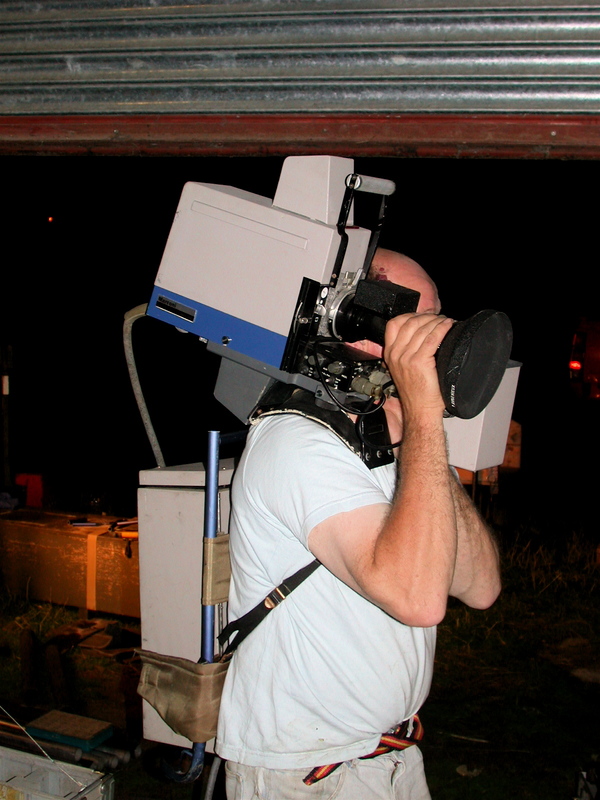 Takes camera weights up to 120lbs. 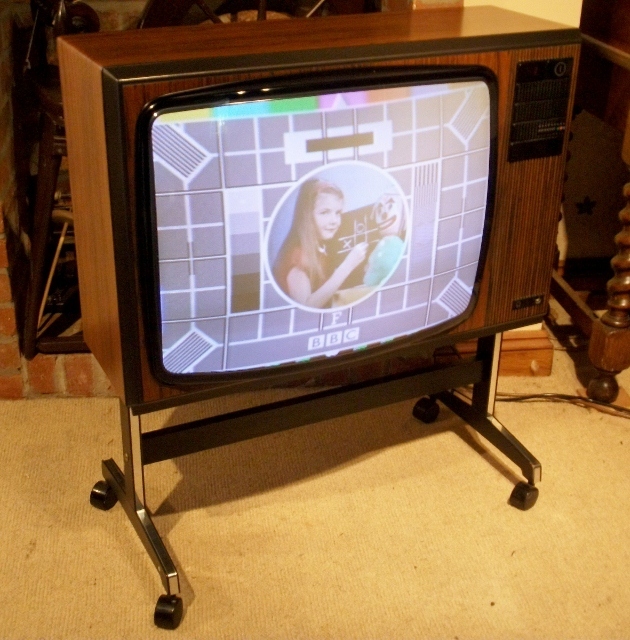 The 'Handy Looky 77' appeared in 1978 and was offered to broadcasters as an 'ENG' camera. 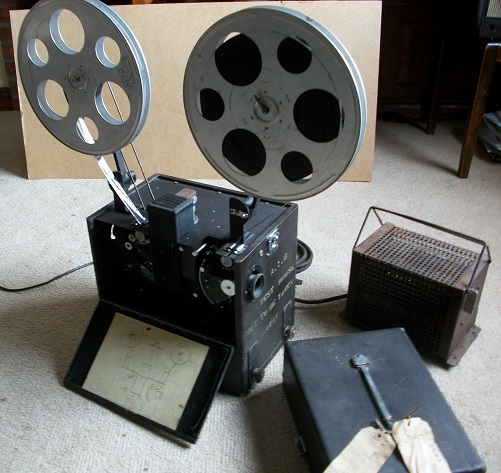 These were early days for electronic news gathering equipment. 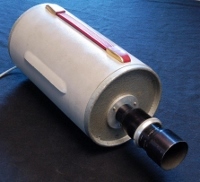 The HL 77 had no on-board record capability, no on-board battery and overall, was rather heavy. 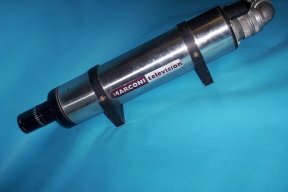 Using three 'Saticon' tubes, our rather careworn example was alleged to have 'filmed' the 1980s Brixton Riots as well as several rather more sedate feature programmes for BBC East. 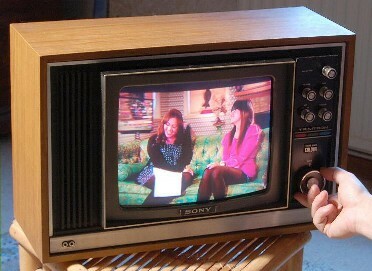 Nice table top b/w 12" tv set from Emerson. 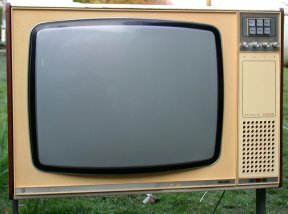 A JVC 14"-inch picture monitor. Good quality images from any source. 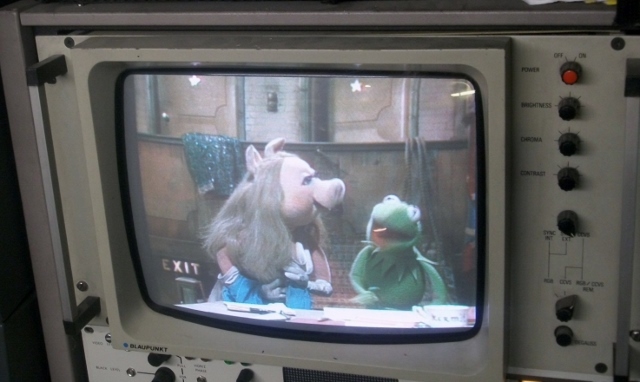 This monitor looks like a domestic tv receiver from the 1980s and will play back live or recorded PAL, NTSC or SECAM standards into two switchable inputs. No need for a converter of any kind, just plug and play. 4:3 aspect ratio only. Will play sound too. The SWAN POST HEAD was designed in the late 1970s by Bill Vinten and Ted Galione. The object was to pivot a cameras' centre of gravity at the side, enabling a wide tilt range. 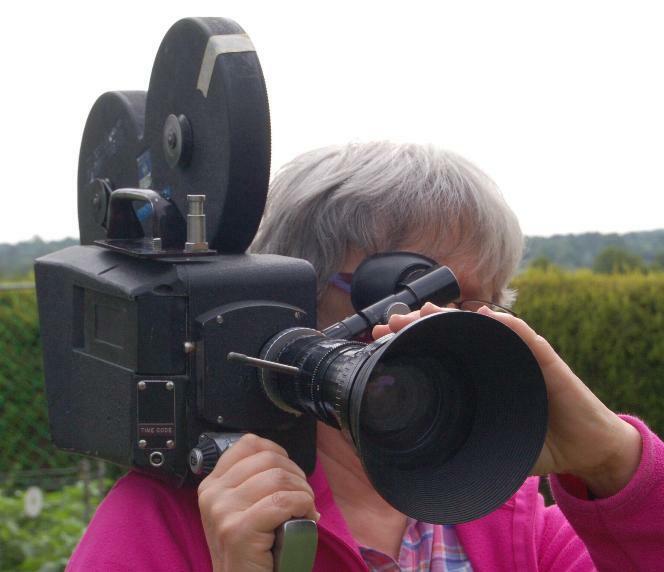 This principle was not a particular hit with cameramen who preferred the usual top-mounted pan and tilt head. 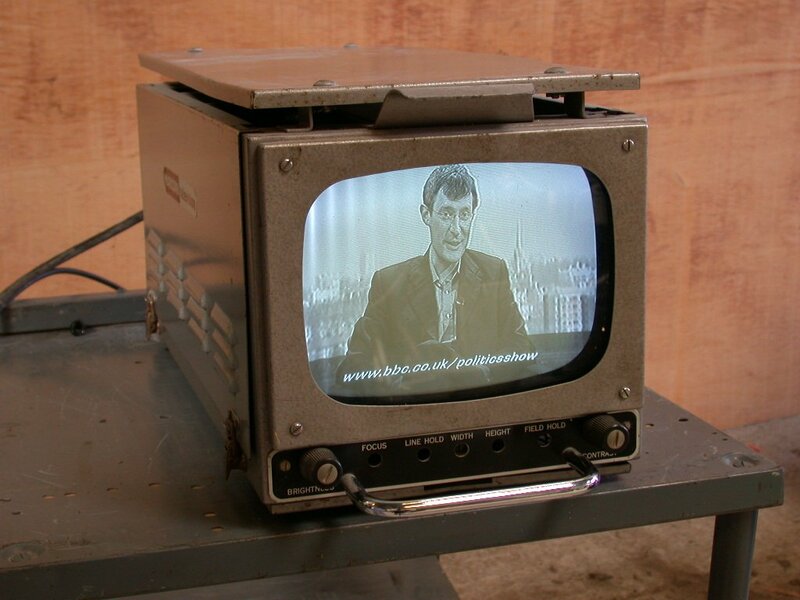 Our Post Head examples were used by Thames Television. Good quality studio portable version of the HK 323, the 323 Portable is capable of full auto line up with a dedicated zoom and in-built diascope. The camera uses three 18mm Diode Gun Plumbicon colour tubes. Triax back adapter. 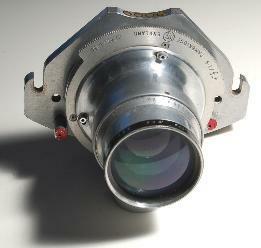 Optional side mounted 5" viewfinder with dedicated bracket (illustrated). Full zoom and focus control available with selected Canon lens. 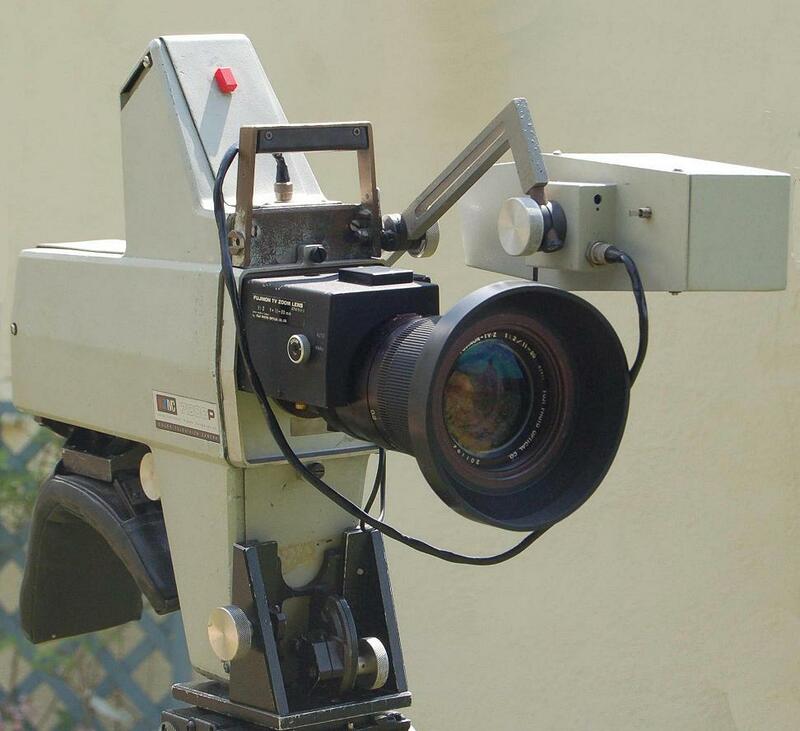 This camera is in operational condition. 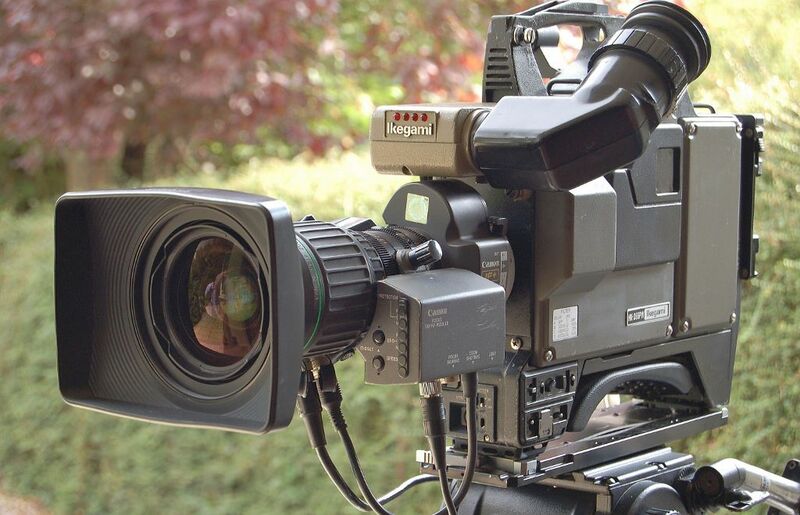 Superior DV camera from Ikegami. Standard resolution wide screen images of excellent quality. 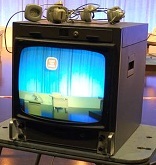 Three-tube colour tv camera with auto line up. 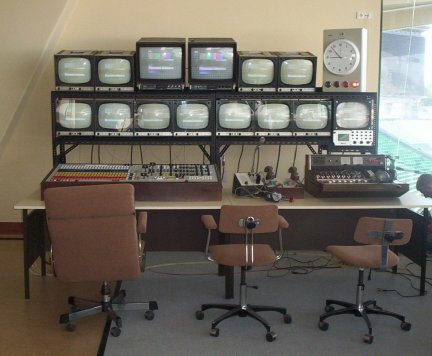 Studio or outside broadcast. Compact design. Optional badging. 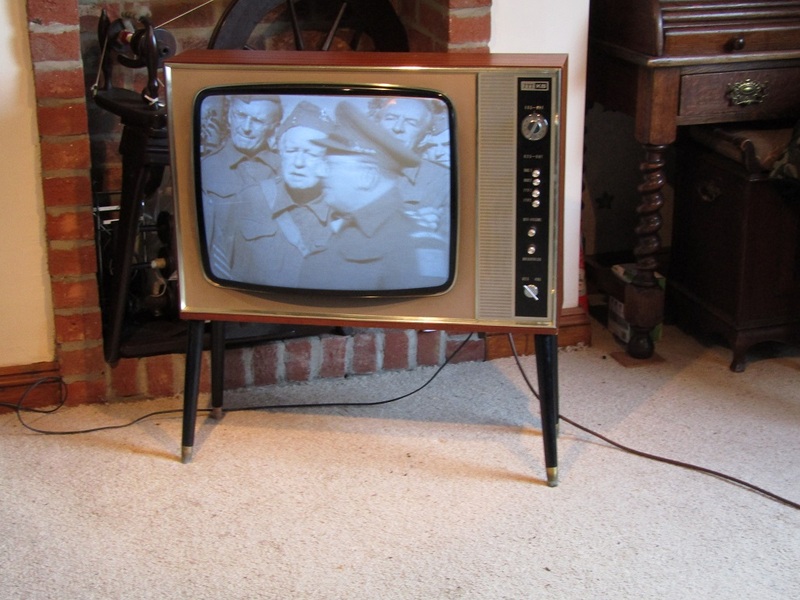 24" dual standard black and white TV on legs in excellent, full operational condition. A real taste of the late 60s. BBC2 ready! Early 70s black and white 12" portable TV that was a 'must have' for any teenager. A very popular set and manufactured in large numbers. 12V capable so also a favourite in caravans and boats. 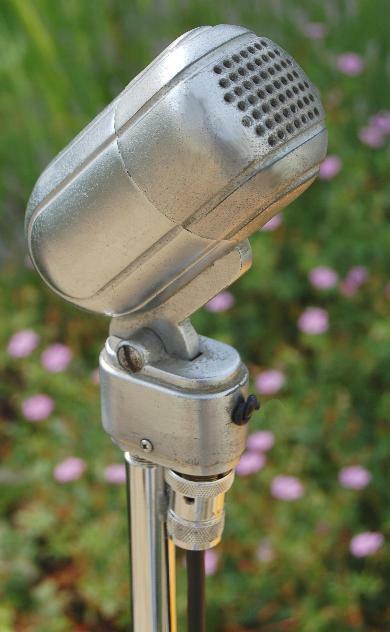 Small battery powered microphone amp. Location use. 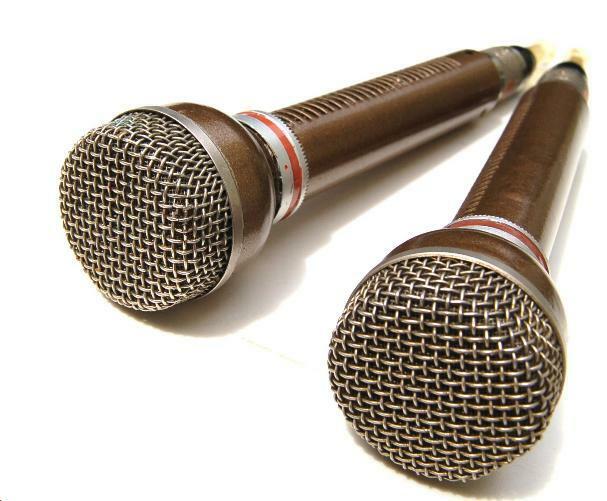 XLR inputs. 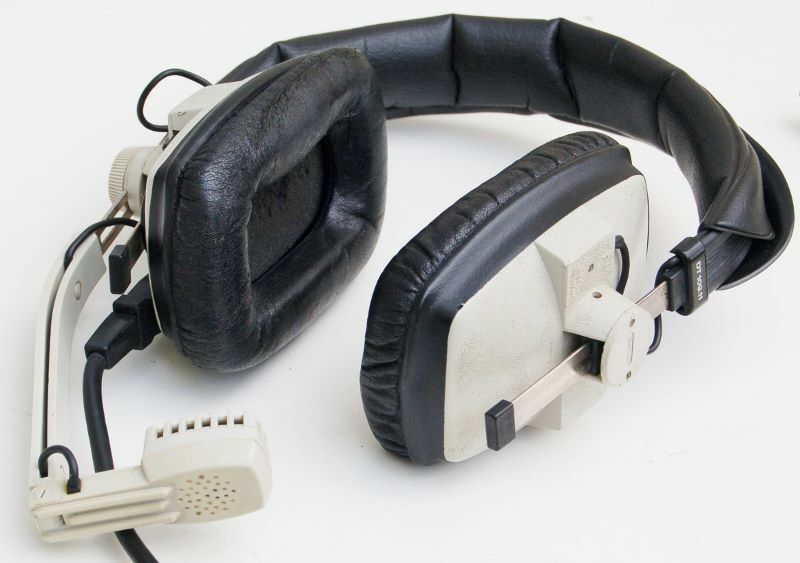 Devised in the 1980s for use with a Nagra recorder etc. 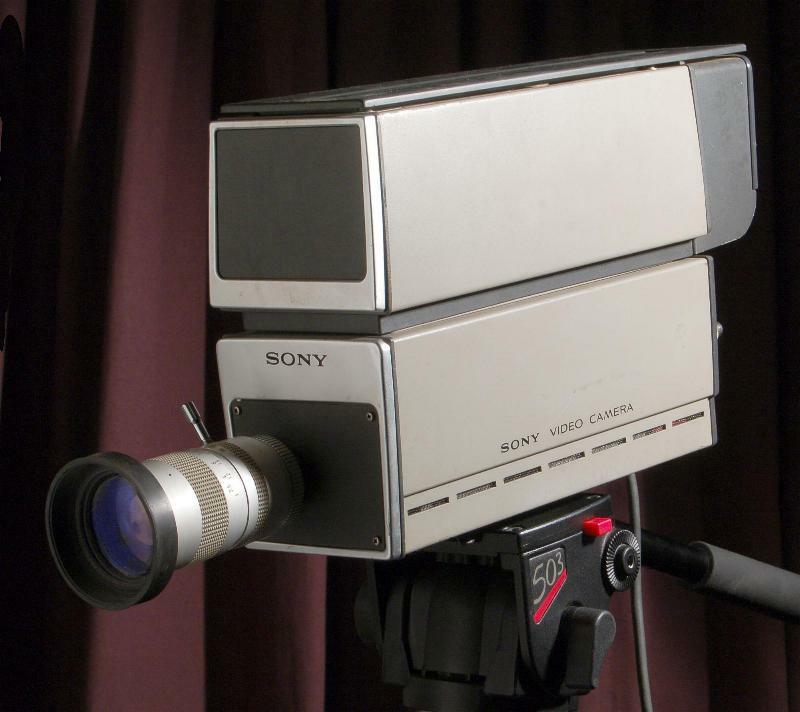 Introduced in the early 1980s, the SONY BVP330 was a lightweight ENG/EFP three-tube colour video camera, battery powered and with a microphone input. 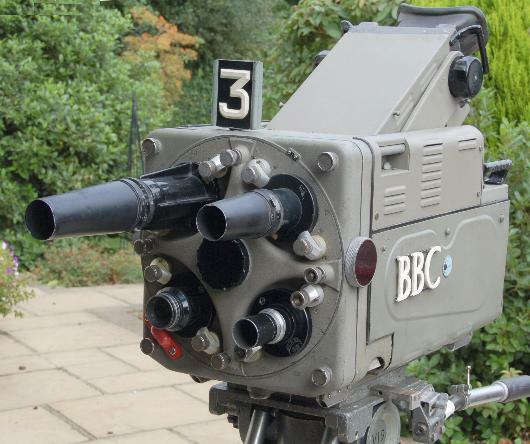 This camera was popular with news gatherers such as ITN. 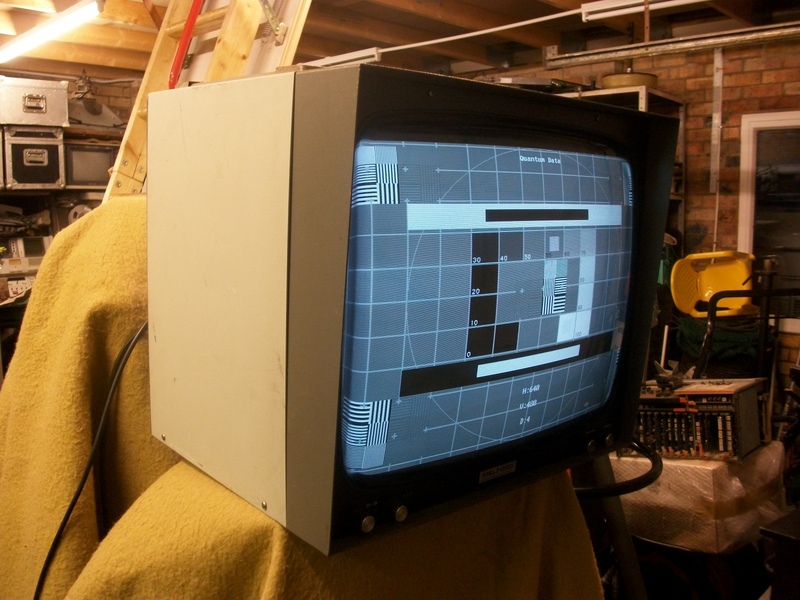 !9" colour monitor using delta gun CRT. 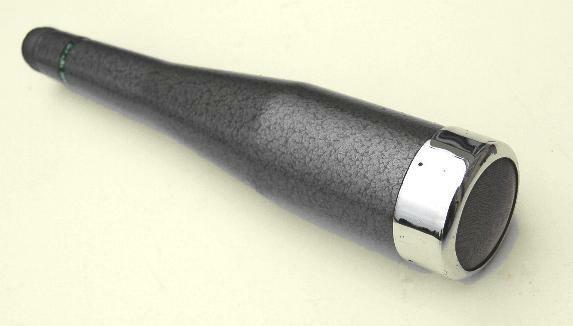 The design is from about 1967 and is all solid-state. Both of our examples are 240V AC and for operation on 625/50 PAL. Currently we have one working and one awaiting restoration to operating condition. Click on the picture for a close view. Upmarket stylish colour tv set from Band & Olufsen. Good working condition. Dedicated stand. 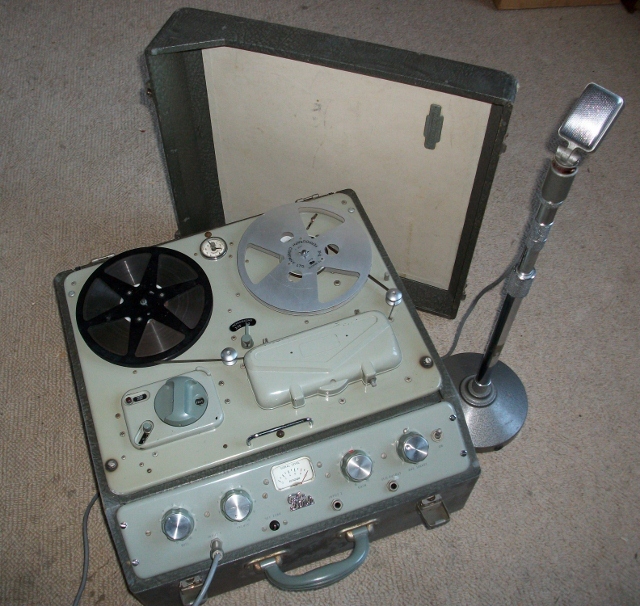 Portable Ferguson cassette tape recorder 1960s/70s era with small microphone, suitable for reporters or interviews. Carry case optional.